For those of you who are beginning the process of starting a garden, reading the posts chronologically may make more sense. They have been posted here in the correct order. I never thought of myself as a blogger; really I’m sort of new to all this high tech stuff. But after trying unsuccessfully to decipher my own handwriting in journals of gardens past, I decided to go digital. 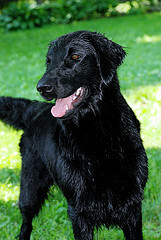 And the only method I could find that can include pictures is a blog! So here we are. So this is a learning process in more ways than one. I come from a long line of exceedingly gifted gardeners but have only been calling the shots myself since 2005. 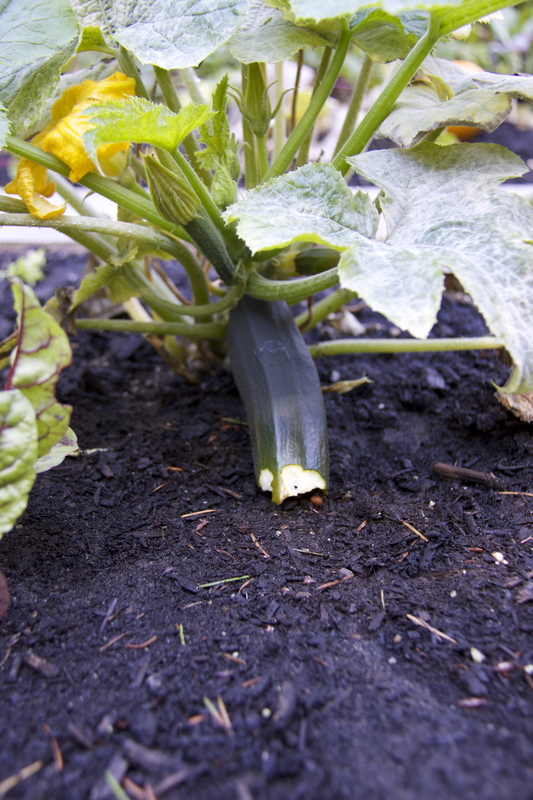 My passion, strangely enough, is growing vegetables. Flowers are great, we have those too, but for me nothing compares with feeding my children something that I have grown myself, that I have seen through from start to finish, something that I know is completely organic and thoroughly healthy. And bringing my children alongside me in that endeavour has been very rewarding. Not that it’s all smiles and handholding. No, it’s even gotten ugly; pain, tears-there’s even been “language”-usually due to some nefarious hare or other trespasser. There have been failed crops, lettuce that bolts the moment it hits the soil and birds that have stolen entire rows of seed tape. I’m no expert-my hope is to record the failures as much as the success in hopes that it will all lead to a better garden next season. And my hope is that perhaps one day, and I am truly dreaming here, this can be a forum where like-minded people can cheer one another on, offer helpful advice and commiserate over one another’s less than perfect results. Perhaps one day. For now, there’s work to do! Who says romance is dead?! The world’s best husband has made me a raised garden bed! It doesn’t get any better than that, baby! So after recovering from a hard winter (by West Coast standards anyway!) we have had a cool spring. 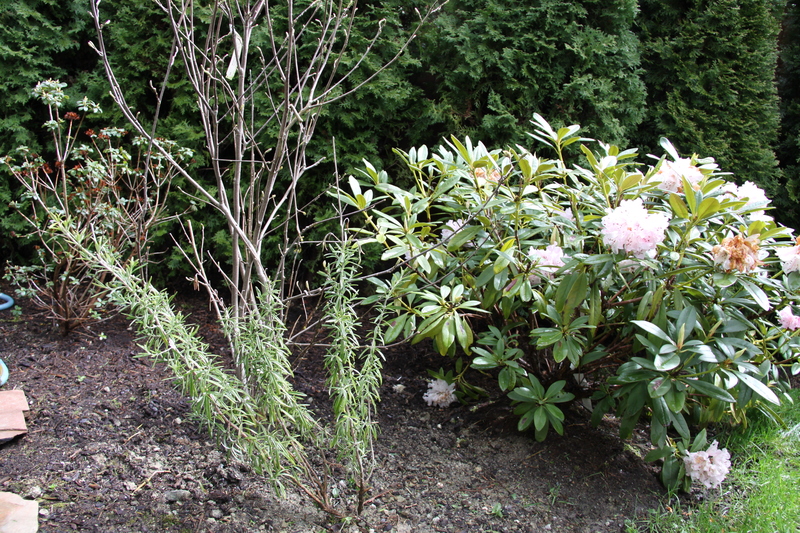 The word on the street is that gardens everywhere are at least a month behind schedule-and a full two months from last year (who can forget our snow-less winter Olympics?!). So it’s been a long time coming, but it looks like we’re ready to go; if only we can get the weather to cooperate. Having just moved, I am, again, starting a new garden from scratch. And just like real estate, it’s all about location, location, location. 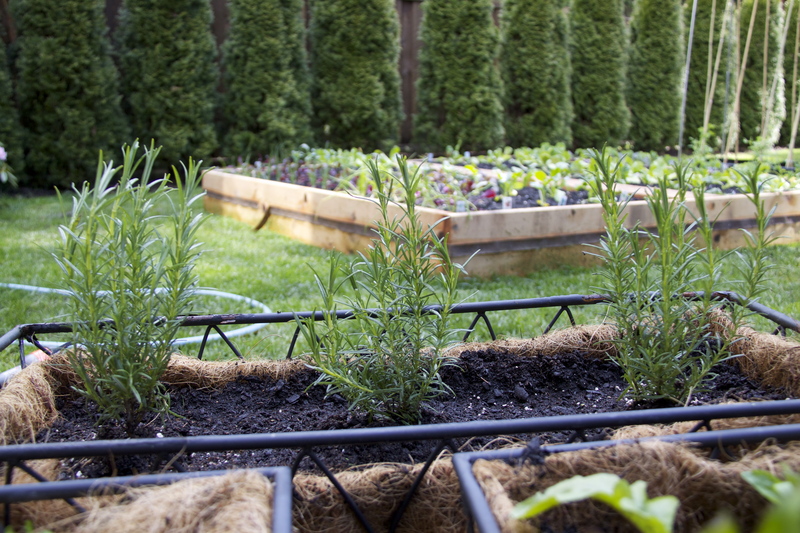 The key to a good garden is of course sunshine; ideally 6-8 hours per day. 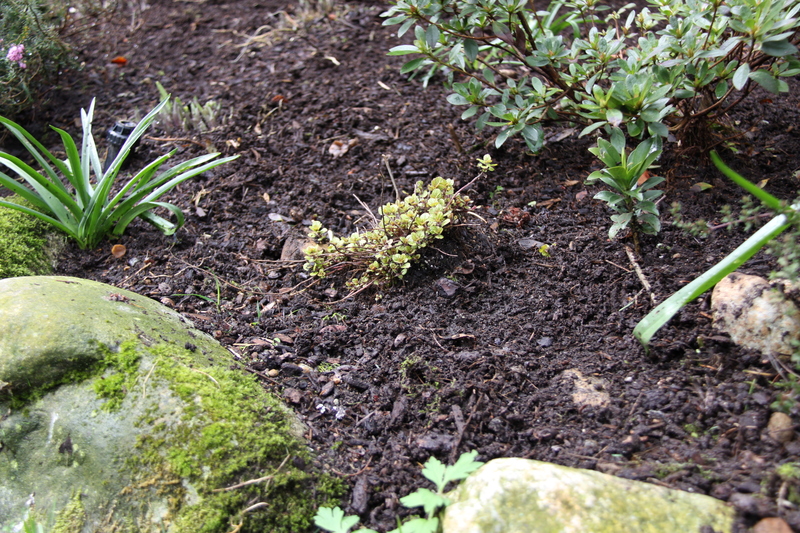 The bed, whether raised or in ground, needs to have good drainage and a pH anywhere from 5.5 to 7.5. Soil here on the West Coast tends to be quite acidic; adding dolomite lime will help raise the pH and is especially important in container gardening. So we’ve used the wonderful naturally rot resistant West Coast cedar; 8’x8‘x12” and filled it with almost two yards of premium garden fill (25% sand 50% composted bark mulch and 25% compost) from Fraser Richmond Soil & Fibre. The plan is to add two bags of the fabulous organic amendment SeaSoil and get planting-we’ll see when that happens! Now if only I can get that damn dog to stop playing in it!!! We all know that bigger isn’t always better, right? I should, yet when my husband was asking me how big I want this raised bed, the answer undoubtedly was “well how big can you make it?”. We reigned ourselves in a little bit but still managed to talk ourselves into eight feet across. And as it turns out, my arms are quite simply not that long (who knew?). So it was either paving stones through the middle or one large beam; we went for the beam. Now the beauty of wood in the garden is that slugs love it. And at the risk of turning your stomach, they tend to congregate under it and then when you use it as a footpath, well, your slug problem tends to decrease somewhat. How soon is too soon? It seems like that’s the question on everyone’s mind-especially given the long weekend that’s coming up. And like many questions, the somewhat frustrating answer is: well, that depends. Depends mostly on what you’re considering planting and where. If the soil is too wet, the seeds will rot. If it’s too cold, they won’t germinate. And if they do germinate and there’s frost, they can be damaged. It is so hard to wait, but the reality is that if we push it and plant too soon we can ruin our plants. And if the weather is too cool, they’re just going to stagnate, be more vulnerable to pests and disease and not grow anyway. For our friends out East and in the prairies, there’s no choice but to wait for now. 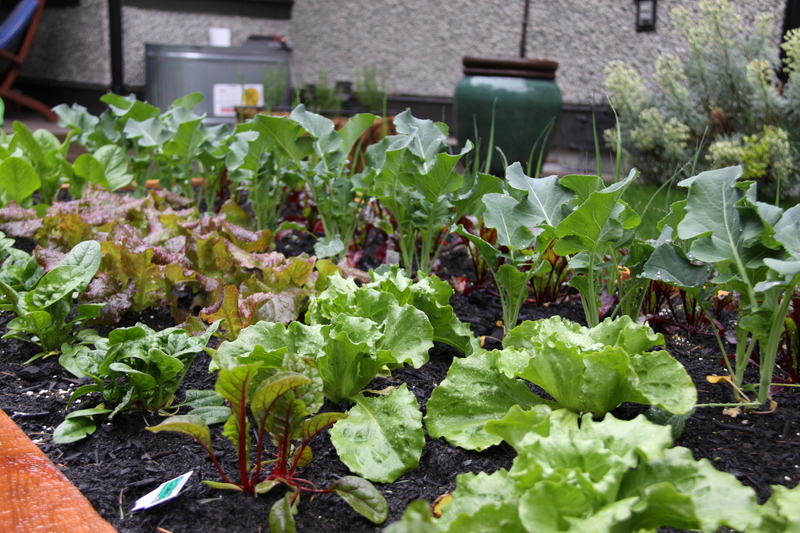 For those of us in the lower mainland and on the islands, we should be okay if we choose our plants carefully and keep some row cover, plastic or an old sheet close by in case of frost; this is especially true if we’re using raised beds as they create a favourable little micro-climate that can help protect the plants from temperature fluctuations. But as far as I understand, even on the West Coast for now this means no tomatoes, no peppers, no melon, no eggplant, no celery, no pumpkins, no basil and no rosemary that hasn’t been over-wintered (man alive-do I ever sound like a cranky toddler!). 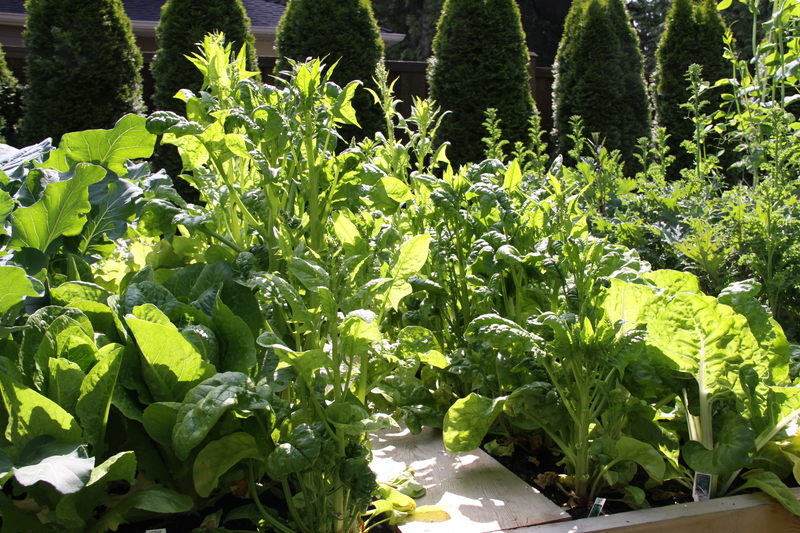 The focus needs to be on transplanting spring/fall varieties that require the slightly cooler temperatures of spring and late summer (more on that later) and direct seeding. Now for seeds, I prefer open pollinated varieties; also known as heritage or heirloom varieties. My hands down favourite is West Coast Seeds. They’re organic and local, so they have a good sense of what works well here. As I’m partial to buying Canadian, I also quite like Pacific Northwest Seed out of Vernon and Aimers Organics out of Ontario. I also have heard good things about Salt Springs Seeds, but I haven’t had a chance to try them personally. One of my mistakes has been to plant seeds too deeply into the soil; apparently the guideline is only 3 times the diameter of the seed. And remember, seeds have a shelf life! 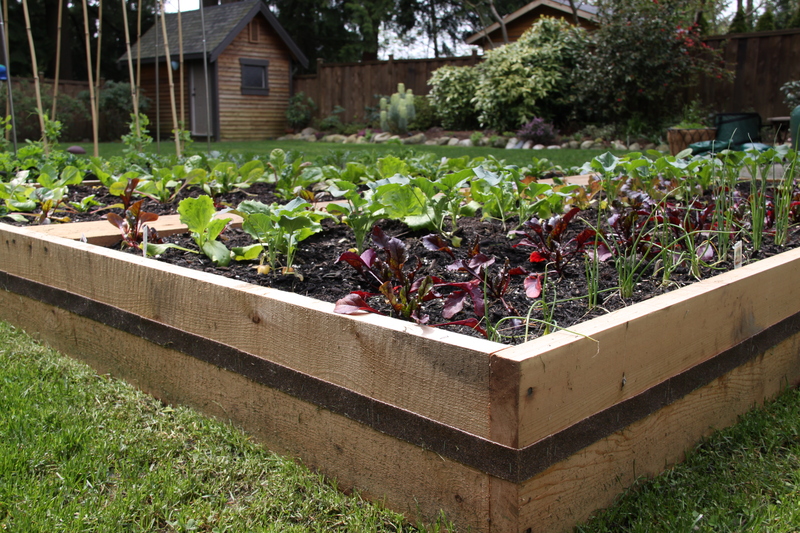 As for what seeds to plant: arugula, kale, radishes, broad beans, leeks, beets, spinach, lettuce, broccoli, cabbage, onions, carrots, peas, radicchio (also known as endive), collards, swiss chard, parsnips and turnips can all be planted now (help me out here, am I forgetting any?). Seed tape is wonderful for helping with spacing, but either way plan to thin out your rows a great deal or the plants will simply not thrive as they compete for resources-many of us have been less than thrilled with crops of tiny little carrots! And a quick word on carrots-many people mix the seed with sand. 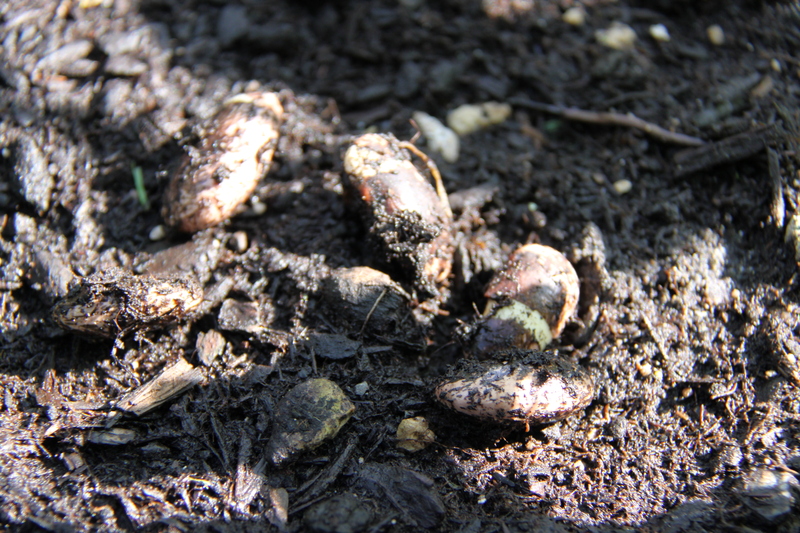 This ensures a more even distribution of the super tiny seed and carrots are said to prefer sandy soil. But don’t go too crazy-too much sand in one part of your garden will just create a bathtub effect. When the rain falls on the soil that has a high content of clay, the water will just run off and head straight for your carrots, which will rot if they sit in wet dirt. So if you need to change the consistency of your soil for one crop, it’s best to do it in a container. And a last word on carrots-there’s a tiny little bug here, the rust fly, that loves carrots; so much so that if you want to have a successful crop you’ll need to cover them with row cover pretty much all the time. 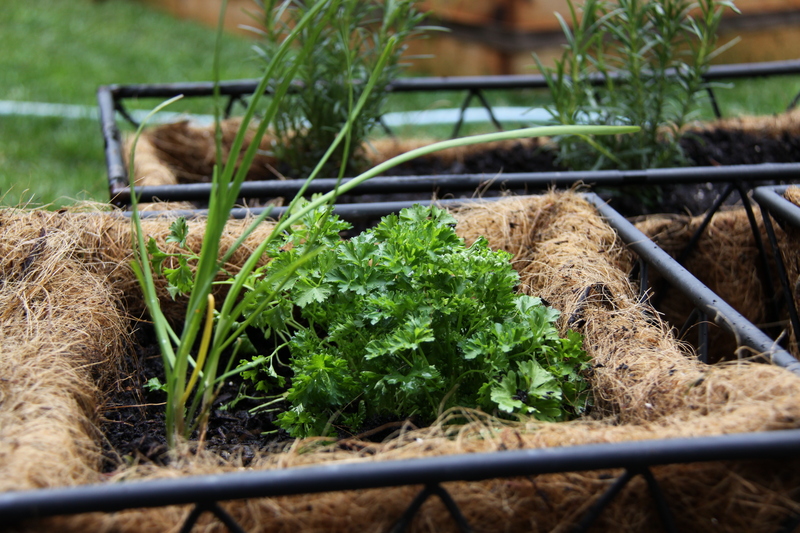 Which is why using seed tape to plant carrots in a slightly sandy soil in a container made of that breathable coconut coir fiber material, which can then be easily draped in row cover, is my official carrot recommendation-phew! 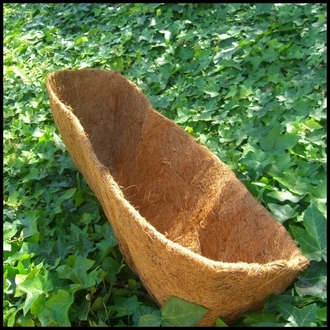 Coconut Coir-it sounds exotic, but you can sometimes even find it at London Drugs. For me, it’s all about instant gratification! Some people start plants indoors from seeds-bless their hearts. It involves dirt, trays, heating pads, special lights, lots of room, patience and cooperative kids & pets. I didn’t go that route; I don’t have any of those qualifiers and I just couldn’t picture my husband agreeing to let me convert our dining room into a greenhouse! For the majority of us, our best option is an instant garden provided by the garden centre, which just happens to be one of my favourite places! I took my eldest and we went a little over board. I prefer to lay everything out before I start digging to avoid having to transplant if (okay, when) I change my mind and need to adjust spacing. Ok, so here’s what we’re looking at below. 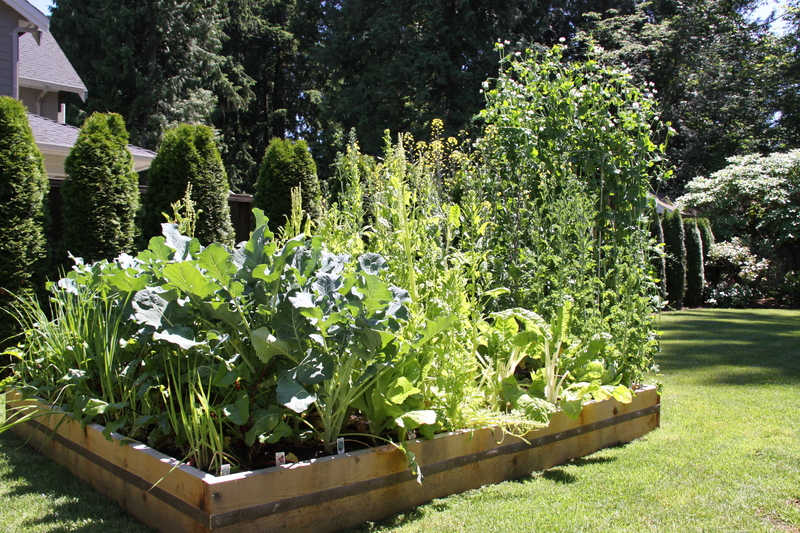 Starting from the top and going horizontally we have: top two rows-17 Kale & 6 Red Russian Kale. 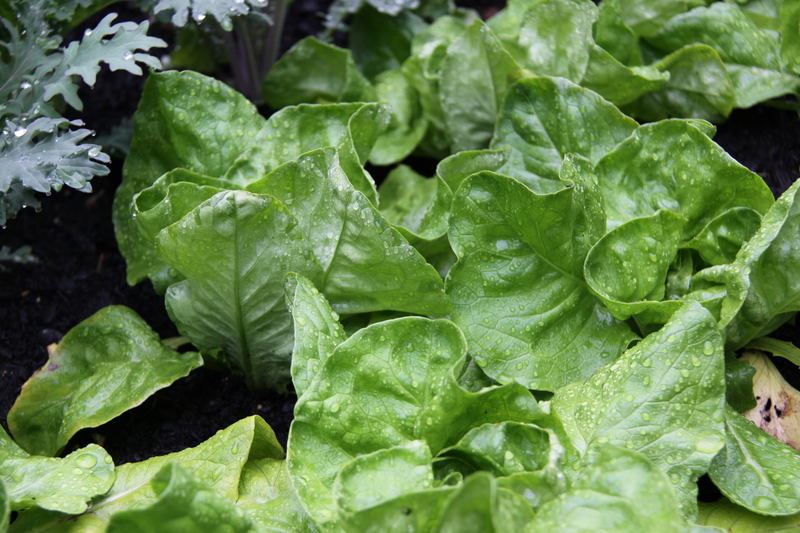 Next two rows: 18 Buttercrunch lettuce. 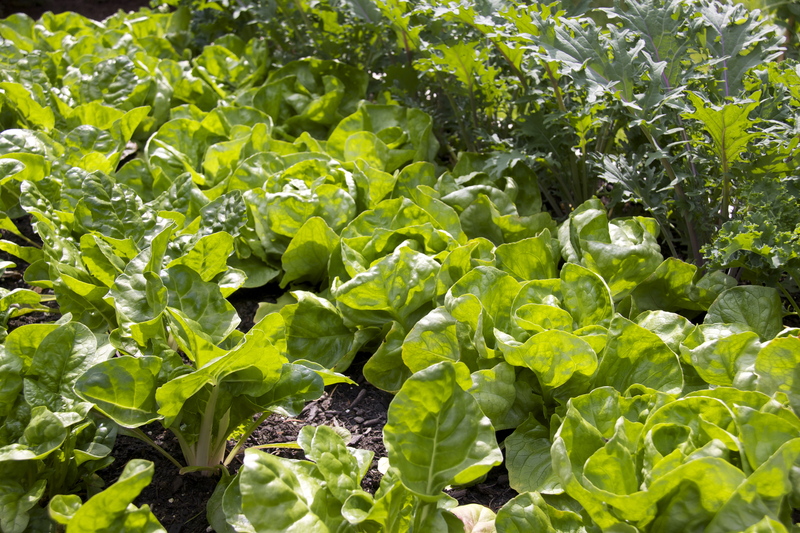 Fifth row: 11 Swiss Chard. 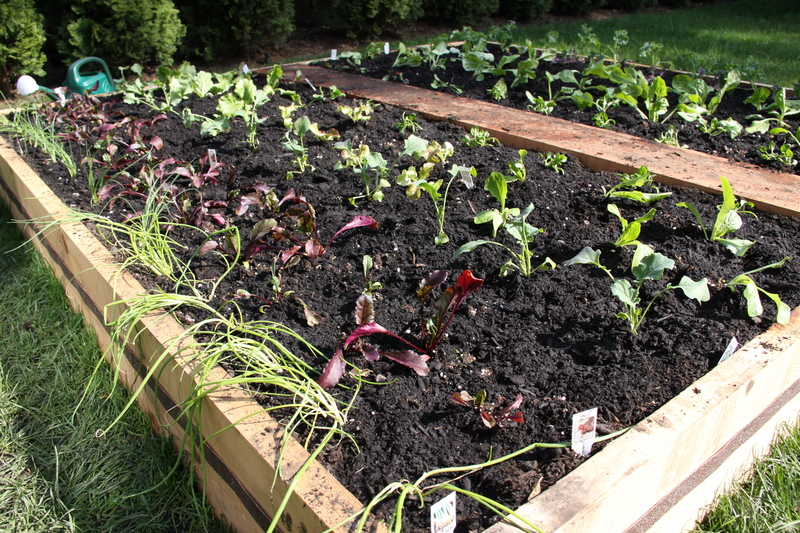 Last row just above the plank: 3 small Red Swiss Chard on the left and then 9 spinach-Noble Giant. 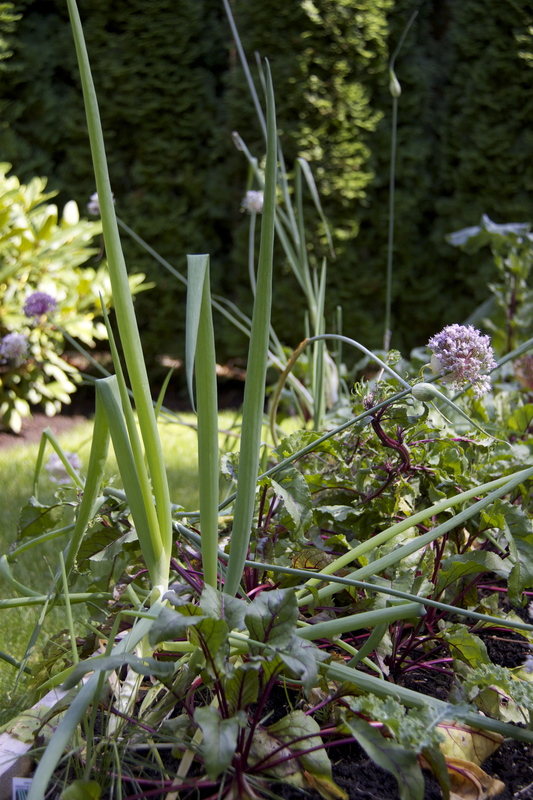 And on the other side, starting on the top left and moving horizontally: 6 green onions, 6 leeks, 6 walla walla onions. The next two rows have 25 beets (one disappeared overnight, I kid you not). The fourth row has 12 broccoli plants. 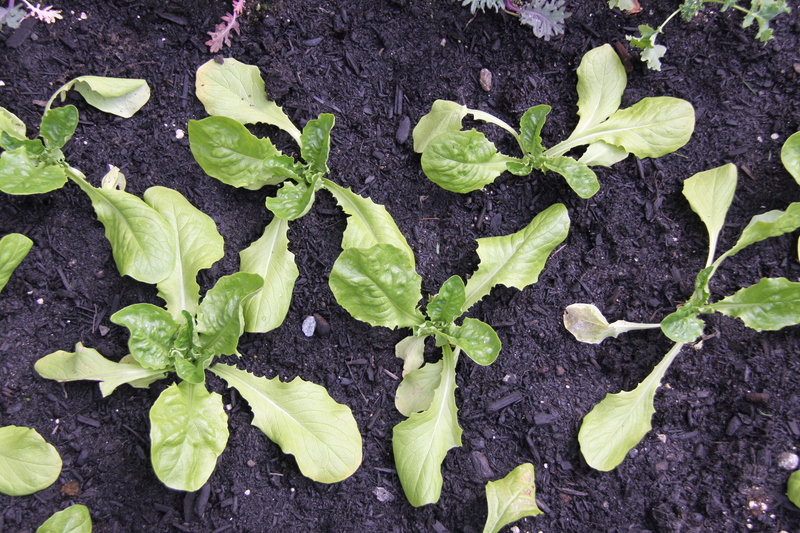 The fifth and sixth row are lettuces planted in clumps; on the left we have Romaine, then Ruby Red in the middle, then Head Lettuce on the Right. 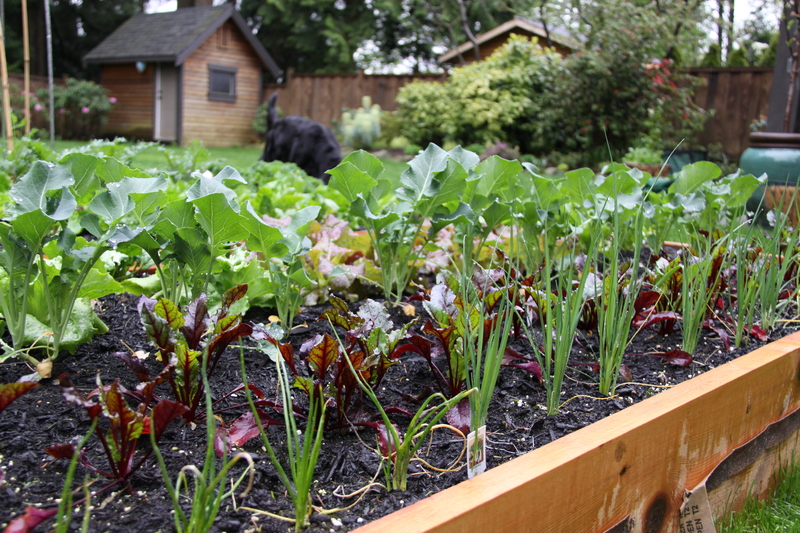 The final row alongside the plank has 6 spinach starting from the left and then 3 Red Swiss Chard down on the right. If you’re wondering if perhaps I’ve over planted, I think it’s safe to say the answer would be a resounding “yes!”. I’m a huge fan of container/patio gardening and it seems as though the big gardening companies are starting to recognize this growing market. 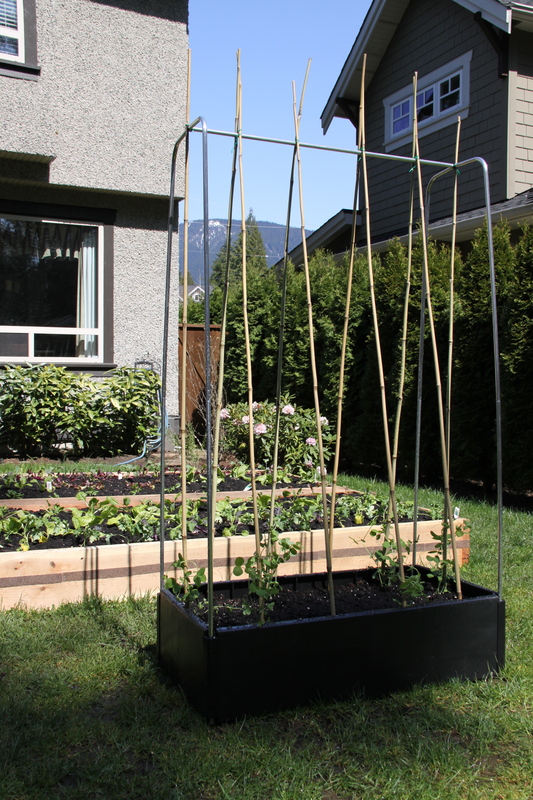 This is great for those in condos or townhouses and it’s a great option for me as I don’t have an obvious place to put up a trellis to support the climbers. One of my favourite new items from Lee Valley Tools solves both these little dilemmas. Putting it on patio stones or a deck is ideal as it will maintain its temperature better; especially important for the germinating seeds. 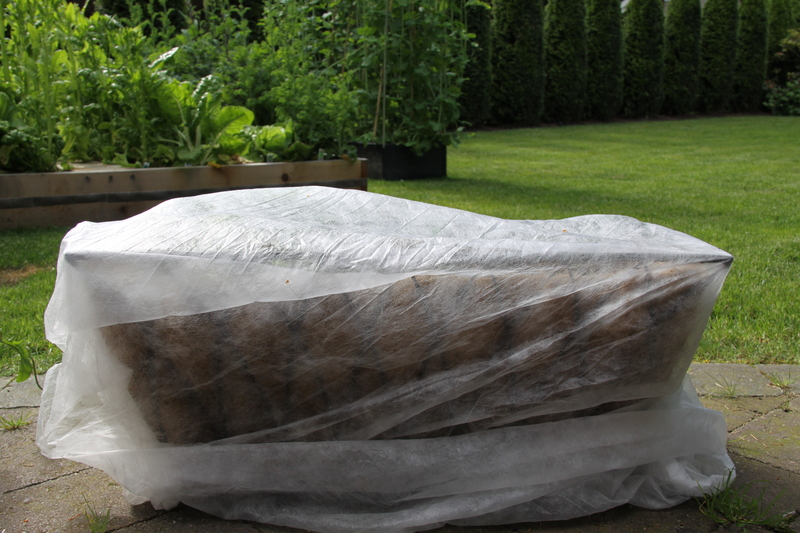 And it comes with a great liner to keep the moisture in and the weeds out. I chose to leave out the liner and put mine on the grass to ensure good drainage; either way works. About five days ago I started soaking Scarlett Runner Bean seeds in water and placing it in the window to accelerate sprouting. Usually I start Sugar Snap peas the same way, but this year I was able to find some to transplant. 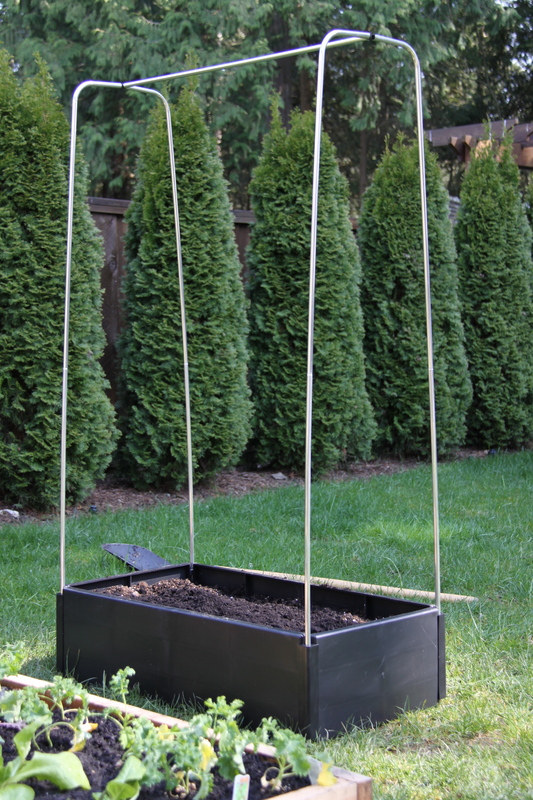 I added ten long bamboo polls that I got from Canadian Tire, planted the bean seeds and peas near the base and voila-another instant garden! I ran a little experiment last fall. When I was shutting things down in October I planted some of the hardier herbs to see if they could really over-winter as perennials or if they were just talking a big game. Little did I know we were in for one of our coldest winters in years! I’ve checked in with them a few times in the last few months; as you can see they look less than appetizing. What’s left of the oregano. 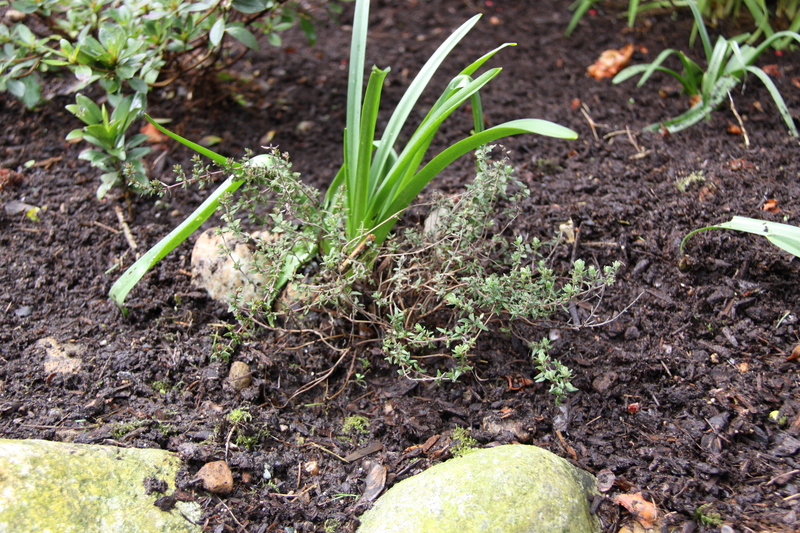 The thyme-invaded by a rogue iris. The rosemary-not too bad; a good back-up. Is it odd I’m relieved to have back-up rosemary…? Perhaps I’m being too picky-I’m sure they would recover but when I’m going to the effort to cook the last thing I want to do is chance it with some dodgy herbs. And it’s been said that herbs taste best in their first year of life anyway. 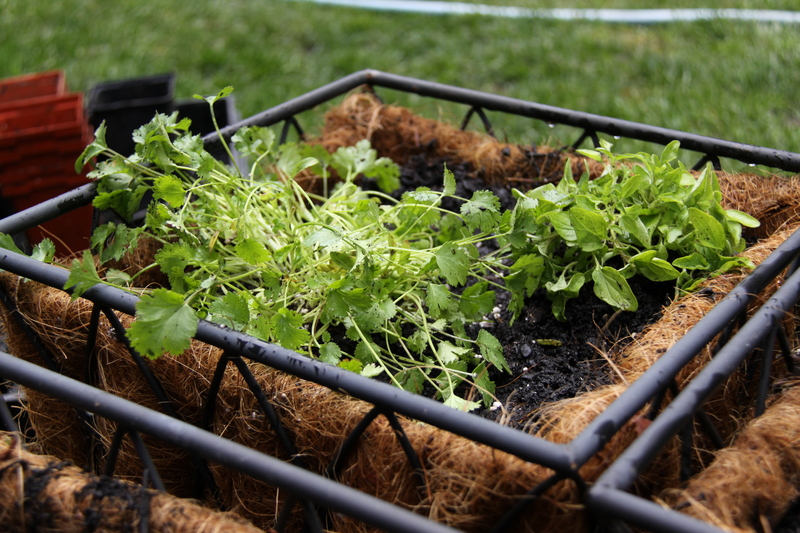 My plan this year is to return to what I’ve done in the past: buy and plant herbs as annuals, use throughout the summer and then freeze the fresh leaves (without drying) to use throughout the winter. Rosemary-my very favourite and the first herb my kids could identify. This is the Garden Pink variety. Some garlic chives and some parsley- I unintentionally grabbed the “extra tripled curled” variety-we’ll see how that goes. Here we have the arugula. The taller one on the left is Rocket, on the right is Astro. Perfect for salads. On the left we have some very floppy cilantro, on the right we have some Golden oregano. And finally we have some admittedly unimpressive looking sage (Grower’s Friend) and thyme (English). They’ll grow. I also planted several rows of Early Nantes 2 carrots from Mr. Fothergill’s-all the way from the mother-land. Nothing to see there, at least for now. Some great emails have come in asking for advice on how to plant; guess I never really covered that, did I? Huge topic-to avoid running the risk of information overload, I’ll explain what I’ve done and offer a couple of other popular options. Essentially what I did is a combination of row planting and triangle formation, which is essentially just staggering your plants along the row so they’re not all side by side. As you can see, the rows run neatly horizontally but not vertically and this staggering maximizes the spacing between the plants while still helping you take advantage of the square footage to increase your plant numbers. This year I’m employing what’s called a “cut and come again” approach, which is a school of thought that says that if your soil quality is high, you can increase your yield by spacing your plants much closer together than previously advised; some say up to 4 inches. You then start to harvest from the plant (usually the outer layers) before it becomes fully mature, never allowing it to reach full size. If you want to bring a plant to full maturity, you can simply harvest every other plant, leaving space for the remaining to increase in size. As far as I understand, this would only work with leafy greens that can be eaten young- other plants such as broccoli need to wait for sprouts, which wouldn’t happen until the plant matures. So we’ll see. 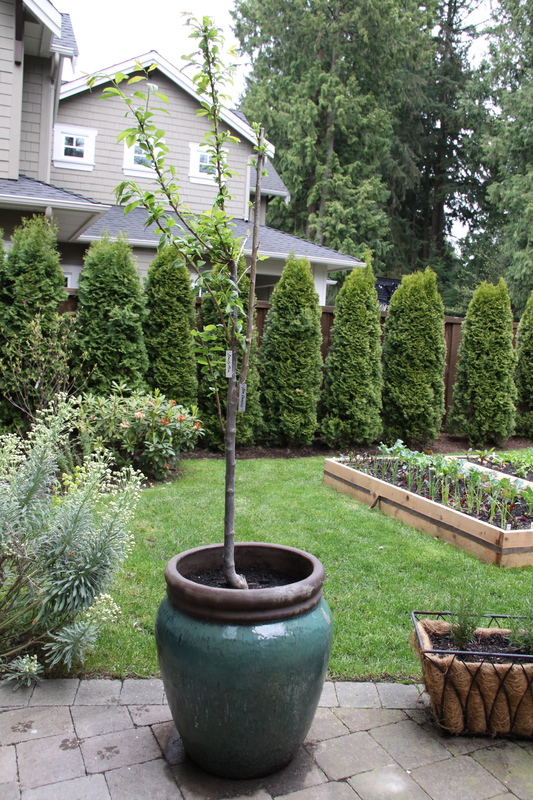 I shudder to think what a Master Gardener would say about this approach (the ones I know are all about lots of space) but I’m willing to give it a go. Now my A type personality seems to gravitate to rows (although a lack of human resources meant I wasn’t able to go the whole nine yards; measure them out exactly and run string across the bed to ensure my rows are straight, but I’ve moved on). This method does help with weeding, insect control and easy sowing & cultivation, but there are other choices. There’s wide row planting, band planting, hill planting (great for potatoes-more on that later) and my new favourite, square foot planting. Opinions abound of course but like most things I think trial and error is the inevitable route to discovering what works best for the space you have. And of course, growing up is ideal, always start with good soil and hardening off your transplants for at least a few days will all put you in good stead. And hey, what’s the worst that could happen? One of my family’s favourite dishes is roasted new potatoes (when I remember to take them out of the oven on time), but I’ve never attempted to grow my own potatoes before; the hilled rows take up a lot of space and are really disruptive to surrounding plants when you have to dig them up to harvest them. So I was thrilled to discover some of the other options out there. And there are tons: you can grow potatoes in wooden boxes, mesh wire cylinders, even old tires apparently. After weighing my options and balancing the concerns of air circulation, water evaporation and my one man work force, I chose a grow bag for this maiden voyage. Potatoes can be planted anytime from mid-march until the end of May, so there’s still lots of time if you’re interested. I ended up grabbing just a display model with absolutely no instructions for $10, but grow bags are available all over the place and at my own personal mecca for under $30. I picked up a bag of the small Norland potatoes that were sprouting and placed three potatoes on top of four to six inches of soil, with the sprouts pointing up. I completely covered them with a couple more of inches of soil, watered them, rolled down the top of the bag and left them in a sunny spot. A couple of days ago I saw that the sprouts have grown. Not the classiest of containers, but it works. Now unfortunately there’s some diversity in the opinions on what to do next. Some sources say to continue adding soil as your plant grows, allowing just the tips to show, some say let them show a couple of inches, a number say they should be up to eight inches. 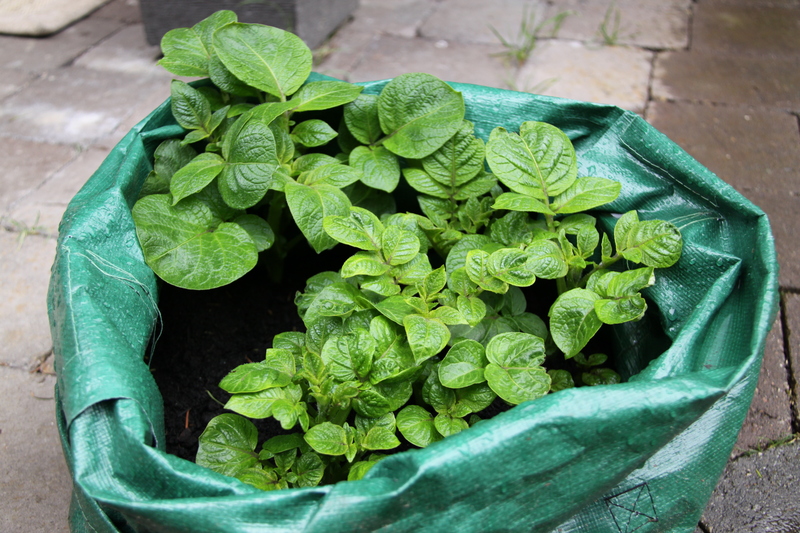 Either way, you continue to “hill” the potatoes as they grow, unrolling the bag as needed, covering the leaves and stems with soil (the potatoes grow from the leaf nodes so it’s necessary to bury the leaves). 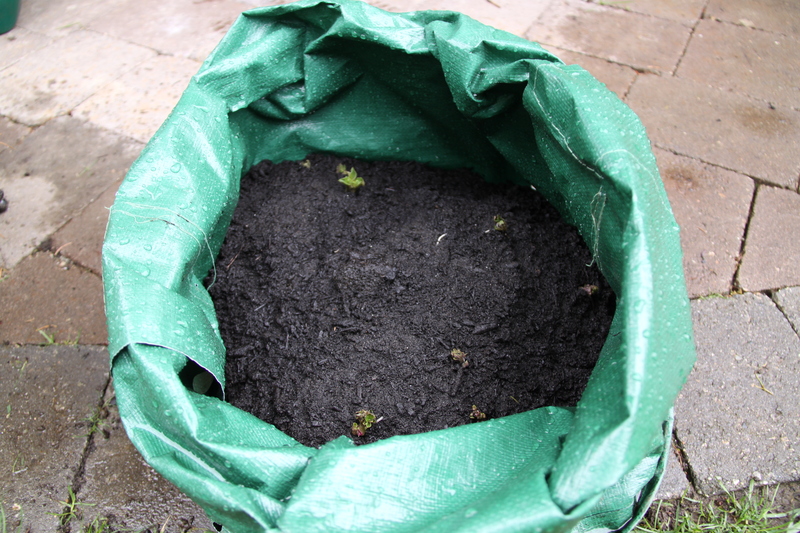 As the summer progresses and the bag has become full, the plants will flower, at which time you can use the side pockets to grab some young potatoes out of the bottom (these young or new potatoes will have the least amount of starch). When the flowers wilt and turn yellow, it’s time to harvest the remaining. 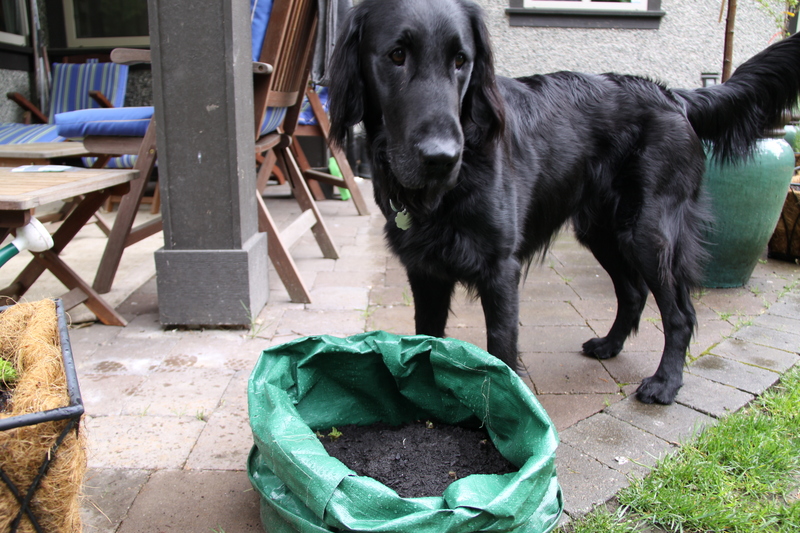 Stop all watering and dig up all the potatoes within 3-14 days, preferably before frost. -liquid fertilizer is recommended to increase harvest; I like Gaia as it’s completely organic. 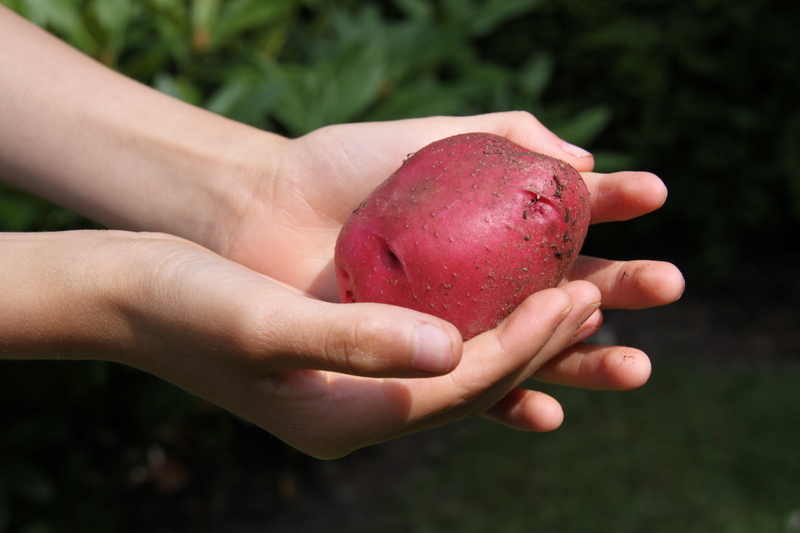 -if you do have the space to plant potatoes in your main garden, just don’t plant them near tomatoes, cucumbers, peppers or eggplant as this will increase the chance of blight and wilt. -after harvesting, keep the potatoes in a cool, dark place and make sure they are completely dry and healthy. Any moisture, imperfection or nick on any one potato will ruin them all. I hope to harvest these before the squirrels, raccoons and skunks do; Sam helps stand guard. I discovered a few years ago that nothing makes you feel like a prolific gardener like a perfectly formed, beautiful head of lettuce. And nothing can obliterate all those feelings of goodwill like coming out the next day to find that same lettuce ravaged and full of holes. As much as I love the idea of living in peace with all of earth’s creatures, when it comes to my garden, I get to the place where I feel the need to participate more fully in the process of Darwinism. Used to be you’d just lay out some snail bait/poison and that would get the job done. And although now there are some more traditional approaches that are organic, such asSafer products, I’d rather not introduce any foreign substance into my garden that will sink into the soil. And so unfortunately for me, organic often means mechanical. One option is to fill yogurt or jar lids with beer; the snails will dive in and not be able to get out and then drown (admittedly, not an ideal death, but that’s what they get for their lack of moderation). 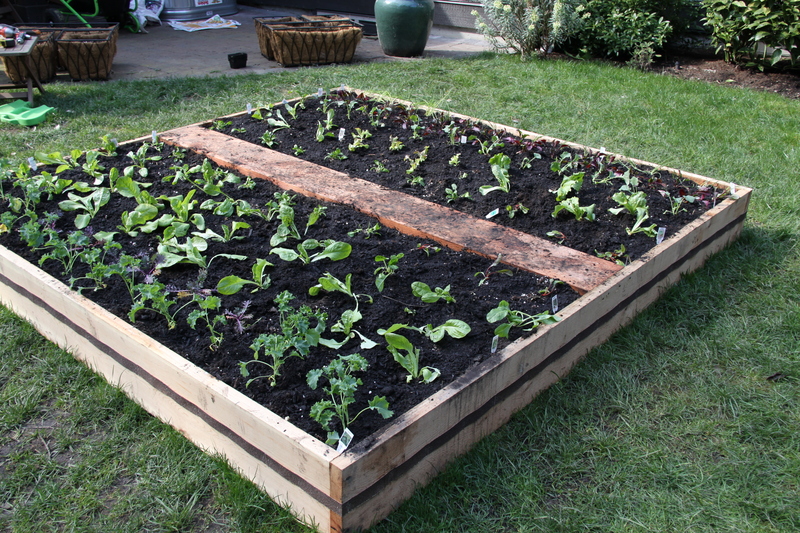 Another idea is to take some broken eggshells and form a barrier around the perimeter of your vegetables. Some would say that when slugs try to cross a band of eggshells they tear their delicate outer lining and quickly die, I imagine by exsanguination or dehydration. However I prefer to think that when they are confronted with this same barrier, they weigh out their options, deem it impassable and simply choose another route-hopefully towards the Hostas. Now I hesitate to share this with you because I’m not sure it’s going to work, but when I was reviewing my options and considering my responsibilities of good stewardship, I thought that attaching a layer of sandpaper around the base of the raised bed may get the job done without any bloodshed. I’m sure if it was that easy, someone else would have thought of it before now, but who knows. Maybe it will work. And what’s really important is that it gave my husband an excuse to buy a staple gun. Apparently you can have it all, and all at once! Our abnormally brutal winter did a lot of damage here on the West Coast and thoroughly killed our two potted Fig trees. But there’s always a silver lining; I then had the happy task of “needing” to fill two large pots. I knew I wanted some sort of edible fruit but I couldn’t make up my mind. Fortunately, I didn’t have to. Here we have a very scrawny plum hybrid. 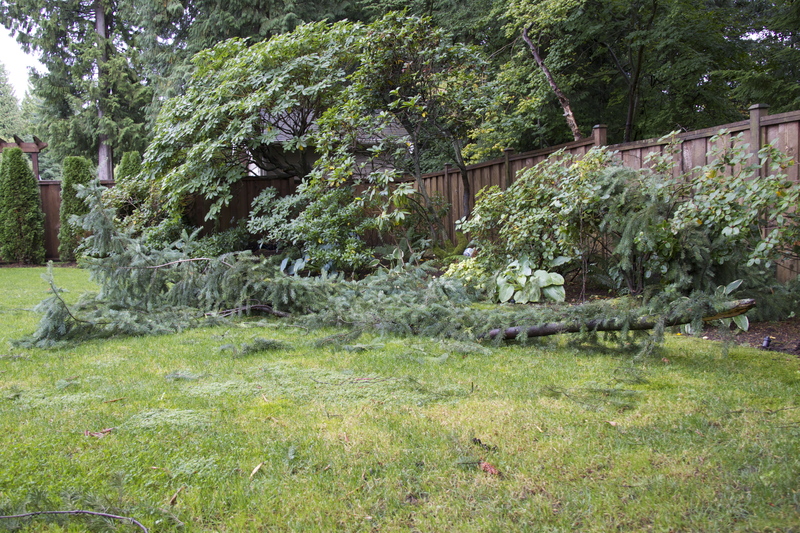 Branches from different varieties are grafted onto the main trunk. If all goes as planned, the tree grows with all transplanted branches producing different varieties of plum. This one has Brooks Plum, Shiro Plum, Blue Damson Plum and Beauty Plum. Above we have a cherry hybrid which includes Stella Cherry, Sam Cherry, Van Cherry and Rainier cherry. Our kids had been asking for some cherry trees ever since they spent the summer climbing and eating from some beautiful old cherry trees in the Okanagan. You can imagine their disappointment when they saw this little one! Now I chose semi-dwarf species as I was limited by the size of my pot-and anything in a pot requires more frequent fertilization; especially edibles. These ones may be able to go a good five years before they need to be put in the ground. Given that this is bear country, I just hope they make it that long! Despite April having been the third worst on record and May looking just as underwhelming thus far, most things in the garden are growing slowing but steadily. Remember when these potatoes were just starting to come up from the soil? I’ll be hilling these this week. 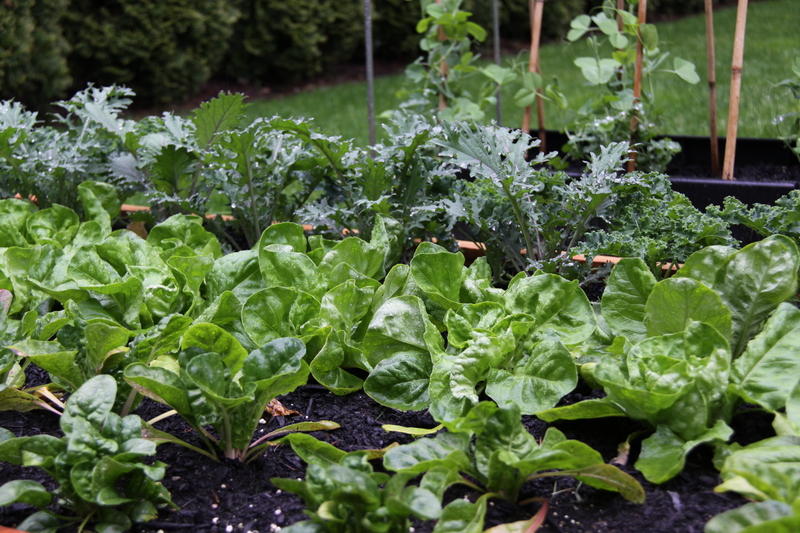 Both kales, the Butter Crunch lettuce and the spinach are all very happy. I really have only myself to blame for “Bad Dog Sam”. 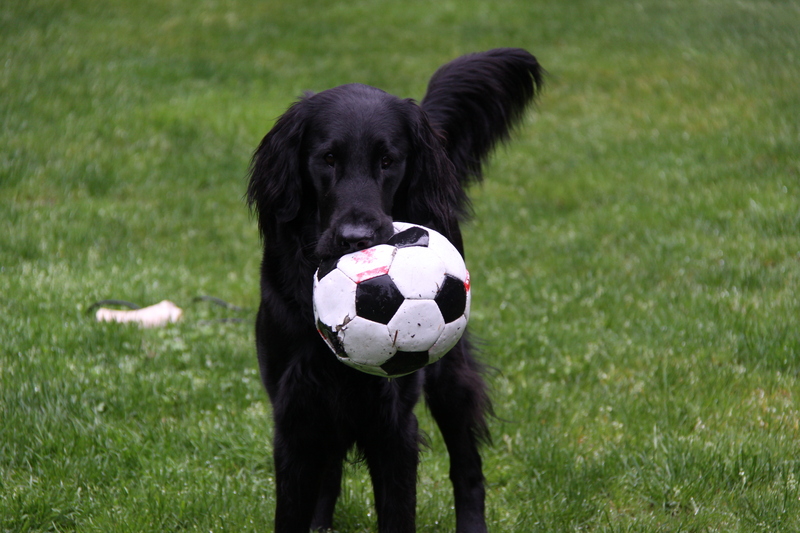 He dropped a ball right on top of the vegetables so of course I muttered something regrettable under my breath and chucked the ball to the other side of the yard. Well, didn’t I just stumble upon the most fun game ever?! Guess what he does every time I turn my attention to the garden now? My impatience has reaped its apt reward. 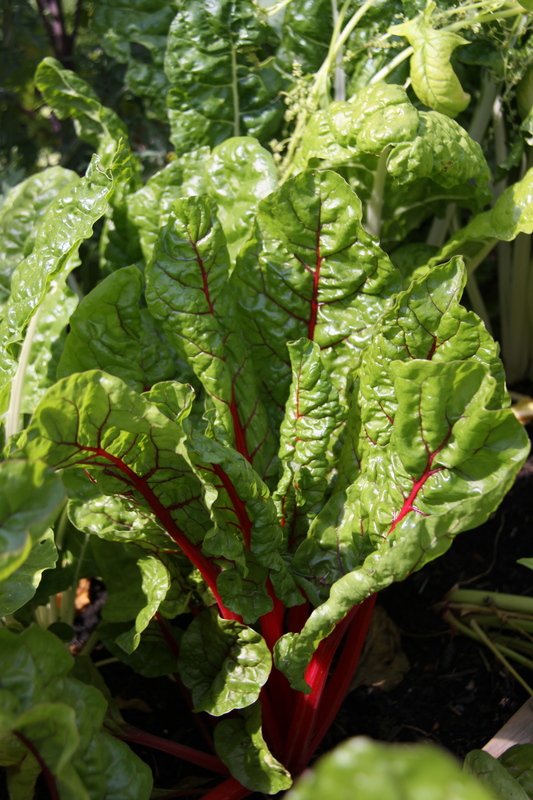 Swiss chard-could be Cladosporium, Ramularia or just plain water/cold damage. When I get excited about the summer and the garden that comes with it, the first thing that comes to mind are the tomatoes and basil. I have to discipline myself to not make my move until the May long weekend; there’s always the concern of frost and even on the coast we hold off as the nights are too humid until then. I figured today was close enough. Lemon boy-matures in 72 days with yellow, 7 oz fruit. 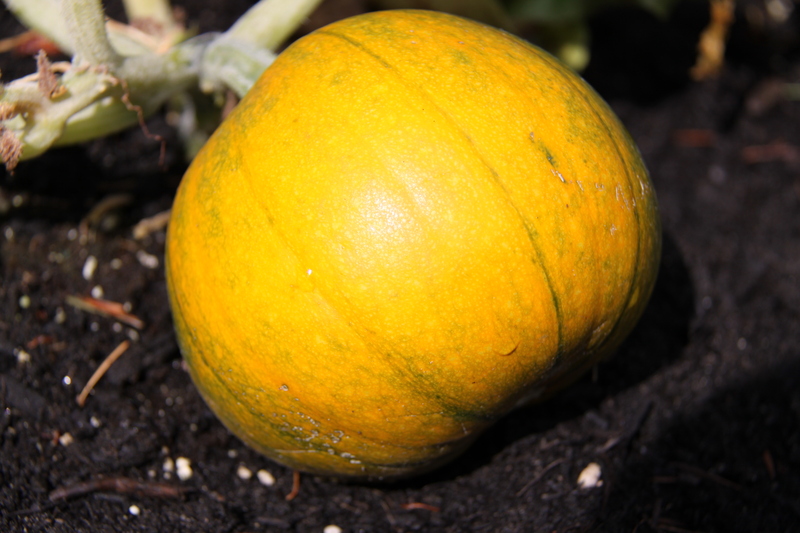 Sweet Million-matures in 60 days, really sweet 1″ fruit. Sweet 100-matures in 68 days, a hybrid that also produces 1″ sweet, cherry shaped fruit. La Roma-my favourite-matures in 75 days, a hybrid that produces sweet, plum shaped fruit with few seeds. Green Grapes-matures in 75 days, an heirloom variety that produces 1″ yellowish-green fruit that hang in clusters like grapes. Old German-matures in 75-85 days, another heirloom variety that produces huge 16 oz yellow fruit with pink and red stripes. And then another old German (I accidentally grabbed two-but I’m not complaining) and a second Roma (totally on purpose). Heirloom varieties are at least decades old and were originally passed down through families. 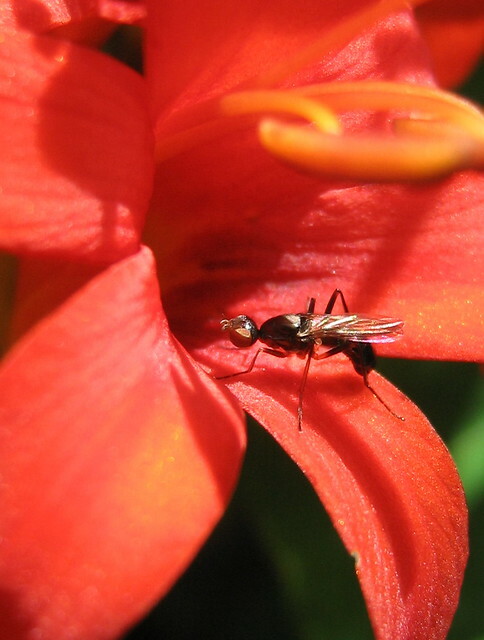 They are left to pollinate naturally-called open pollination. 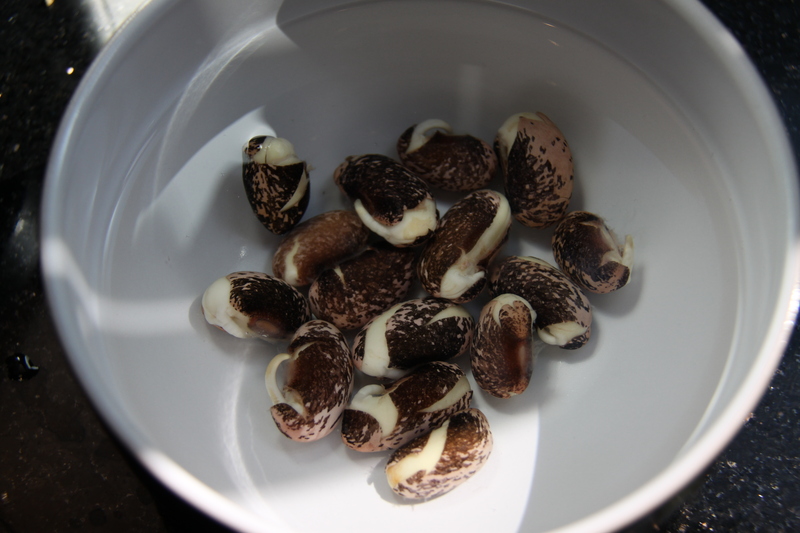 They are chosen for specific traits such as taste and disease resistance and the seeds are retained for planting next year. They’re known for their great taste and unique colours and shapes, but can be a little picky about growing conditions and are not quite as sure a thing as hybrids. Hybrids have been bred to be reliable, productive and resistant to disease by intentional cross-pollination. Always a solid choice. 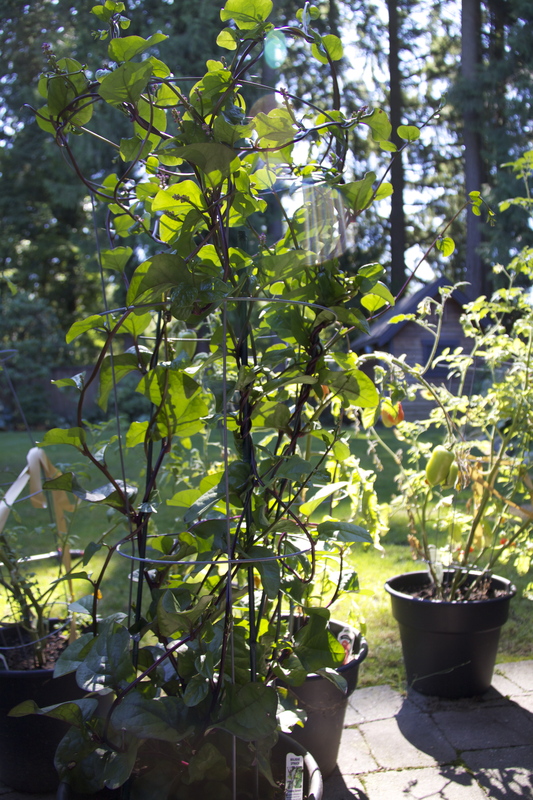 Determinate tomatoes, also known as bush tomatoes, stop growing once they are around four feet high and tend to crop fairly quickly, with all their fruit maturing within a couple of weeks or so and then shutting down. 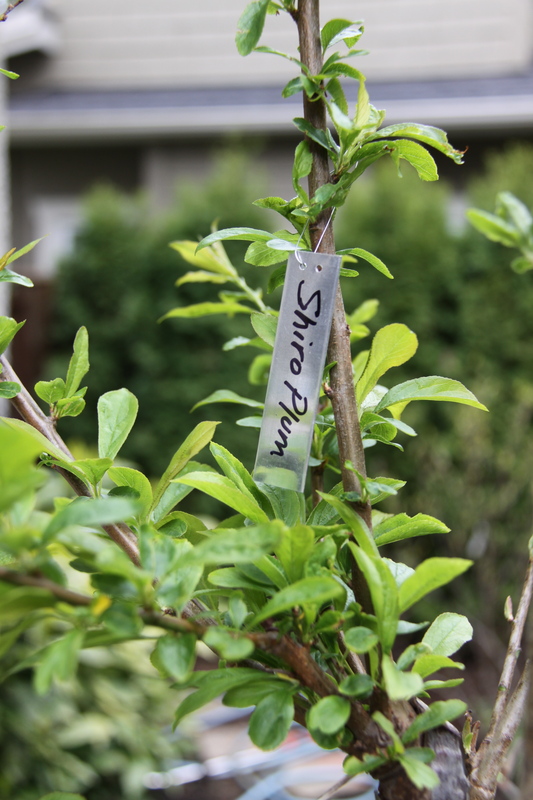 In-determinate varieties will continue to grow and produce fruit throughout the season until frost shuts down the party. So what you choose depends on if you want all your fruit to be ready at once, say for canning, or if you want to be able to eat fruit throughout the summer. 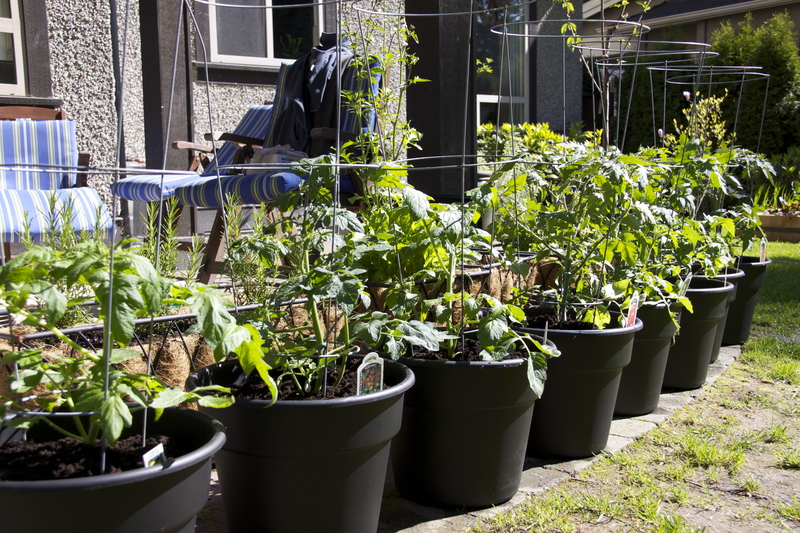 -tomatoes love as much sun as possible but will require daily watering when it’s hot to avoid wilting and to ensure the fruit is sweet; especially if in containers. -against a wall or garage, or on top of patio stones is an ideal location as it helps retain heat and creates a little micro-climate. I chose black pots for the same reason. 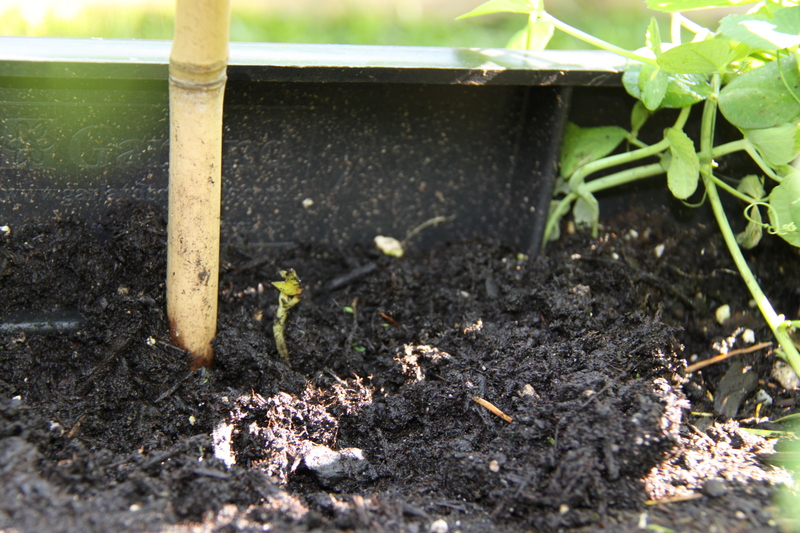 -Tomatoes love to be planted in a compost rich soil; you won’t be surprised to hear I chose Seasoil. 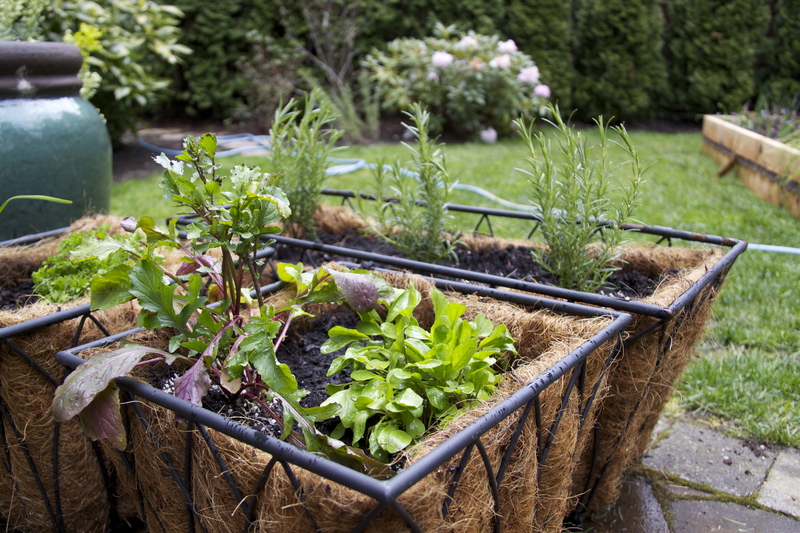 If they come in a biodegradable peat based container you can leave it on as long as you completely cover it with soil (otherwise it will wick the water away from your tomato). And of course we should harden them off for several days just like any other plant. -Stake them and stake them early, before you damage the roots. I chose the supports above; really helps in keeping them off the ground. -keep them off the ground! 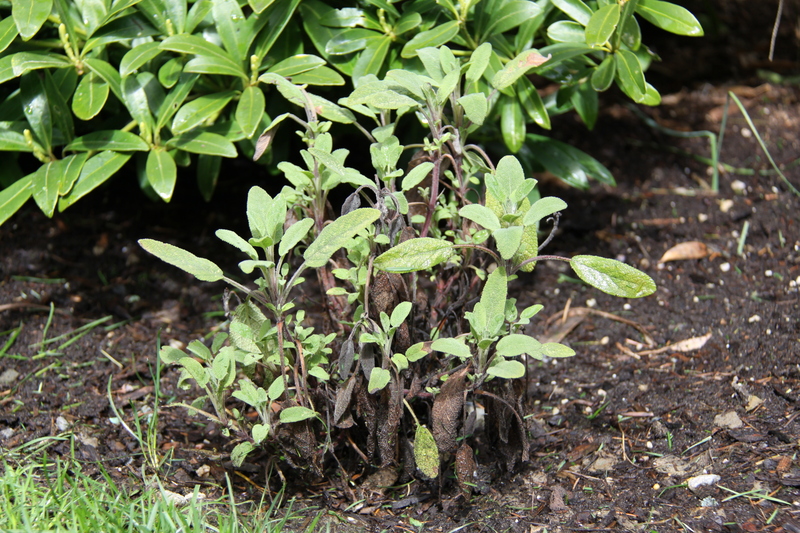 They will quickly succumb to blight and disease if left to rest on the soil. Remove any yellow or spotted leaves immediately. -pruning off the little stems that develop at the crux of a branch will encourage the plant to put more of its effort into the fruit. -Apparently the fruit needs a consistent night time temperature of no less than 13 degrees to set and I recently read that if day time temperature goes over 24 degrees, the tomatoes risk becoming soft on the vine and may have to be picked daily. Either way, picking them when they ripen will encourage more fruit. 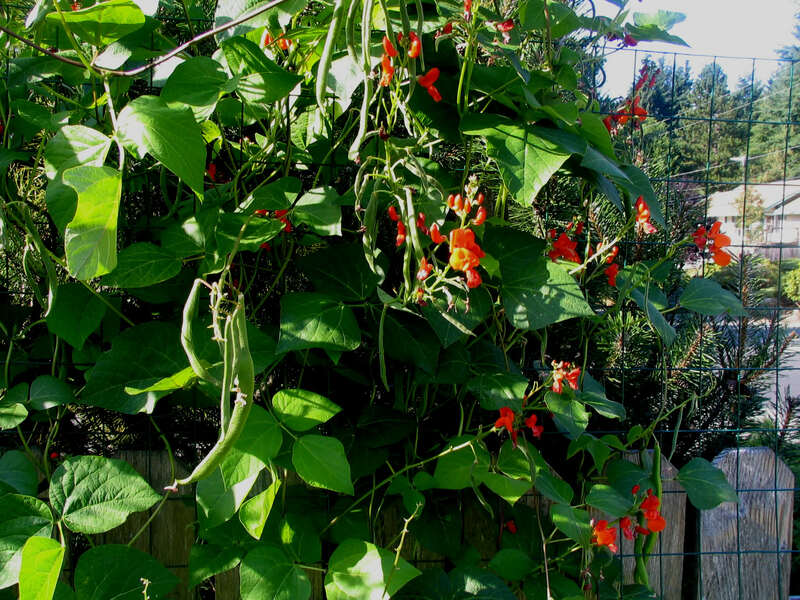 Anything left to wither on the vine, whether beans, peas or tomatoes, will signal the plant to stop producing. I chose cedar for this planter. 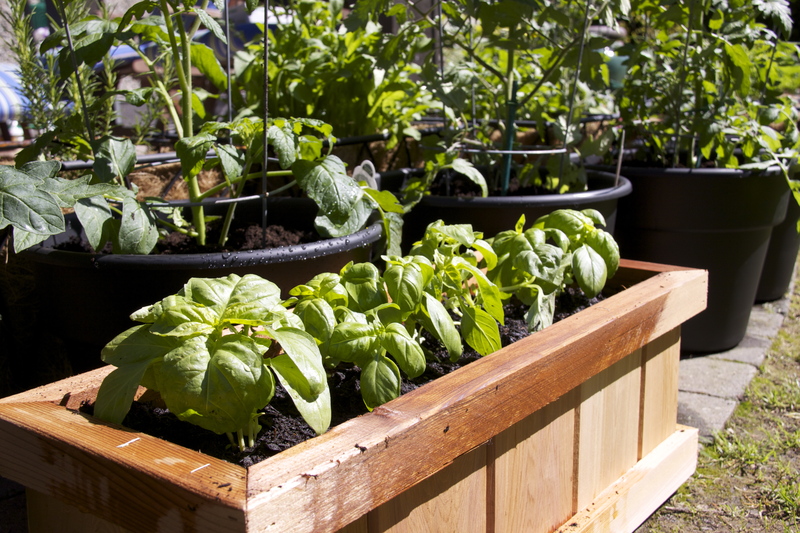 If you’re planting directly into the soil, tomatoes and basil make for great companion gardening and will help one another’s development throughout the season. Pinching back the flowers will encourage the plant to put its effort into leaf production; as will regularly harvesting the leaves. Confession time: my dirty little secret is that I love my basil plants-so much so that I have a hard time using them and have even bought basil from the store to avoid “wrecking” the beautiful plants I have at home. It ends this season! I always struggle a bit this time a year; the garden looks so full and lush-it’s almost a shame to harvest it. But that is the whole point, isn’t it? Growing food that my family can eat…? Alright, pep talk complete; let’s go. And it’s worth it. Here we have Red Bowl and Buttercrunch, perfectly dressed with nothing but extra virgin olive oil and fresh cracked pepper & sea salt. Next to tackle is the Kale; the sheer amount of it all is somewhat intimidating. We’ll save that for another day! We have had our coldest April and May in 50 years, with record low sunshine and higher than average rain fall. I’ve been feeling my share of garden angst, which is quickly put into perspective when considering farmers are also dealing with seed & plant rot and massive crop failures. What I got: dark brown, mushy, slimy seeds that failed to thrive. This is the best of what was left. So round two. I soaked the remaining beans for a couple of days and replanted just last week. I honestly have a ridiculous amount of Kale. And given how much it’s been producing, I could have easily planted a third of what I did. But you can’t complain about abundance. Here it is in the back row; still towering despite my aggressive harvesting. Now don’t get me wrong; I am a huge fan of Kale. 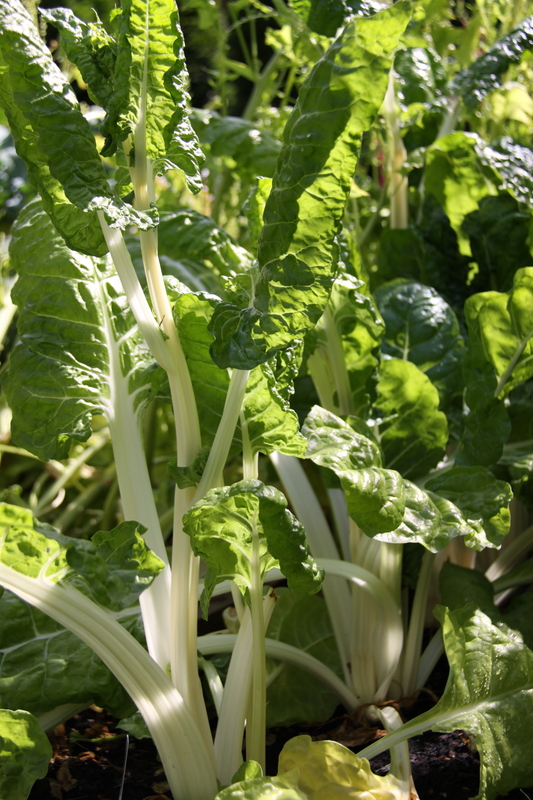 It’s full of vitamins A, C B6 and K and is a great source of fibre and calcium. And you can grow it all year long; it will tolerate full summer sun but can also happily over-winter in the garden as it thrives in heavy rain and is even sweeter after first frost. My children and the neighbourhood kids have taken to eating it right out of the garden but for the rest of us, steaming it for 4-8 minutes and adding to everything from mashed potatoes for the Irish dish Colcannon to tossing it in tahini is ideal. Just leave the plant intact and harvest from the base of the stem. Keep the leaves and discard the stem. I’ve been freezing it so I can add it to soups, stews and tomato sauce later in the year (which is somewhat neurotic considering I may never run out of the fresh stuff-especially given that it will self-sow!). And you can even dehydrate it to make kale chips; Karen-can we talk you into sharing your recipe…? I love the idea of winter gardening; I just don’t have the self control necessary to leave myself any space in the garden to do it-this year every available inch has unfortunately been spoken for. In case you don’t have that problem, or if maybe there’s a corner that was just waiting for some inspiration, the next few weeks is the perfect time to plant some seeds so that you can harvest throughout the winter. Some good options to try: swiss chard, garlic, spinach, beans, lettuce (Romaine and Red Bowl only; Head lettuce and Buttercrunch have too high a water content to survive freezing), kale, onions & leeks, brussel sprouts, cabbage, purple sprouting brocoli, carrots, beets, rutabaga, cauliflower turnips, Bok Choy and radishes. And remember, many transplants would wilt in the summer sun. Plant seeds only, unless starting in late July or August (except for broccoli and brussel sprouts; those transplants can hack it). The warm soil and sun will help the seeds germinate , the plants will mature in the cooler fall temperatures and essentially be in cold storage throughout the winter for you to use as needed. I didn’t just “jinx” myself, did I? I recently realized that nothing makes me feel older than saying something I soon discover is completely culturally irrelevant to my children! Thankfully this ineffective, Popeye-themed motivation isn’t much required with my kids-they help themselves to spinach right in the garden (at the great peril of the plants themselves, unfortunately). You can see here the remaining spinach that has managed to stay planted despite the little hands that harvest it; that’s it on either side of the wooden walkway. 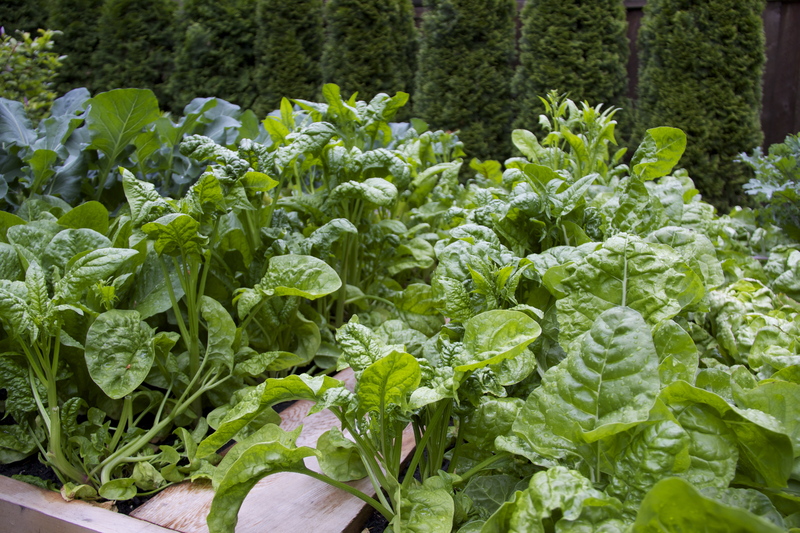 It seems crazy, but we’re already nearing the end of spring’s spinach season. You can see by the flowers that it’s already started to bolt, so it doesn’t have a lot of time left. I’ve already cut off the flowers to slow it down and I’ll be harvesting a lot of it today. We’ll enjoy the regrowth until the leaves start to thicken and taste “woody”, then it’s time to pull out the plant until we can start the cooler late Summer/early Fall planting. One of the curses gardeners must contend with is the wretched rust fly. Similar in appearance to the average house fly, the rust fly’s sole mission in life is to find and infest carrots, parsnips, celery, celeriac, parsley and dill. They lay larvae which then feast on your crop, leaving pitted vegetables with black rings and holes, making them unfit for human consumption. Your best line of defence is a prophylactic measure; cover all the above mentioned plants with row cover (be careful you don’t grab crop cover). This will allow sunlight and water through but will impede the rust fly from getting to your carrots and the soil around them. Rotating your crops from season to season is also a good idea, as is harvesting your carrots and other vegetables promptly. Now, it’s not Fort Knox, but I thought I had done a fairly substantial job of securing the few carrots that managed to come up-until I found one of those sneaky little pests crawling up the underside of the row cover. I admired his dedication, but needless to say he met with an untimely demise. And speaking of carrots-make sure you choose a compost amendment for your soil that doesn’t include any manure or your carrots will come out very hairy…which I personally find not particularly appetizing, but to each their own! Not sure what happened here; it looks as though some critter partially un-dug the arugula and it managed to dry out before I discovered it. Has anyone else suffered the same fate and gleaned some insight? 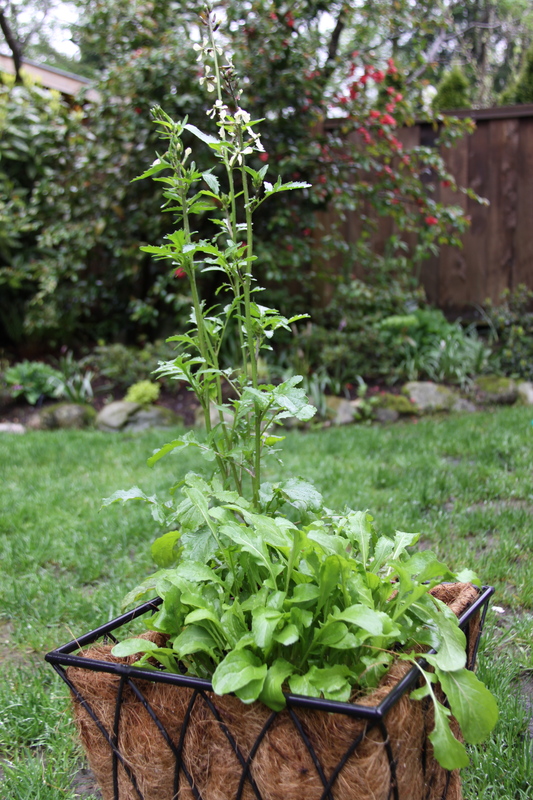 It is somewhat disappointing; I’ve had nothing but raging success with arugula in the past and as a perennial it had proven to be a reliable and welcome staple. Silver lining-I now have a container available for a new addition! In other news, I’m still getting a lot of good kale, lettuce and spinach, thanks in large part to the cooler temperatures we’ve had lately. 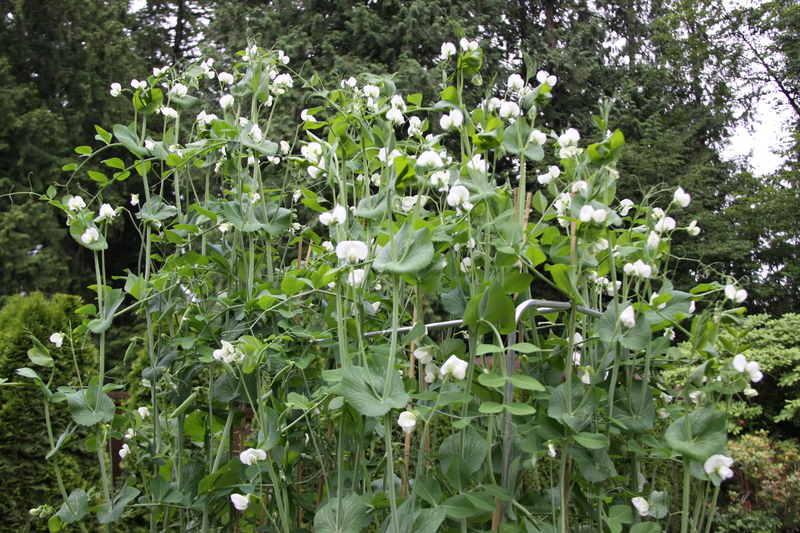 The first of the peas are starting to appear; and the plants are now taller than me! And all of a sudden your garden is out of control and has taken on a life of its own. As you can see here, the Red Russian Kale has gone to flower, the spinach, kale and swiss chard have shot up and all of the lettuce is in need of harvesting. How does it happen all at once?! Of course there are many advantages of a quickly growing garden, not the least of which is getting to see the second generation of your plants come up. 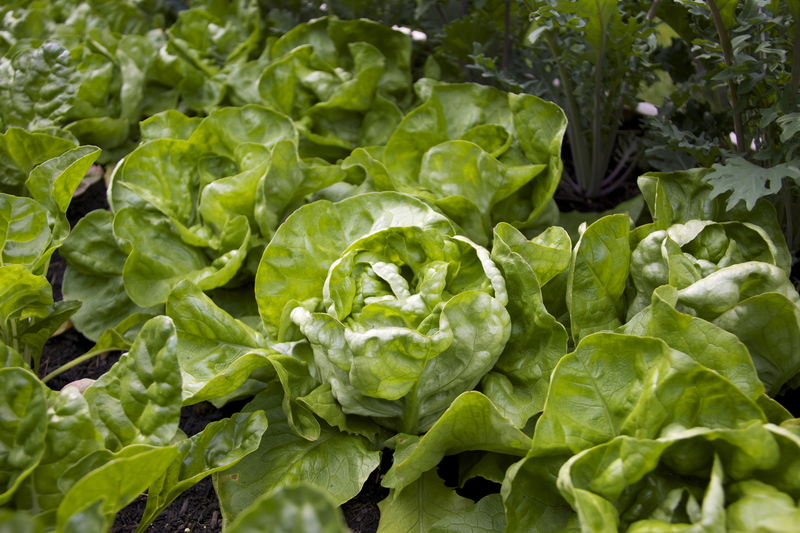 Here we have some new butter crunch lettuce, compliments of the “cut and come again” method that I wrote about earlier. Instead of pulling out the entire plant when harvesting, I took a knife and sliced the head off, leaving the roots intact. A couple of weeks later and we can see the regrowth appearing. The challenge will now be harvesting everything before it’s no longer usable. Anyone hungry?! 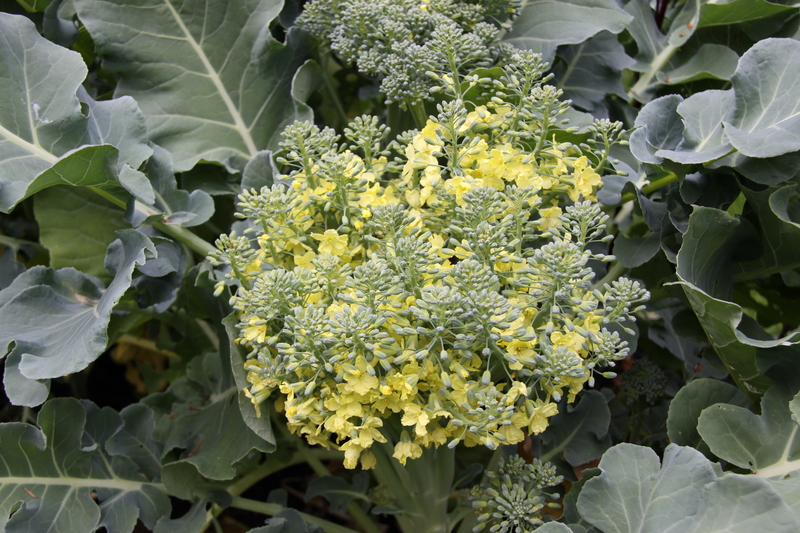 West Coast Seeds recommends cutting the central head as soon as the buds begin to flatten and before the yellow flowers appear. This will encourage the side shoots to produce harvestable buds as well. The further down the main stock you cut, the fewer, but larger, side shoots will develop. 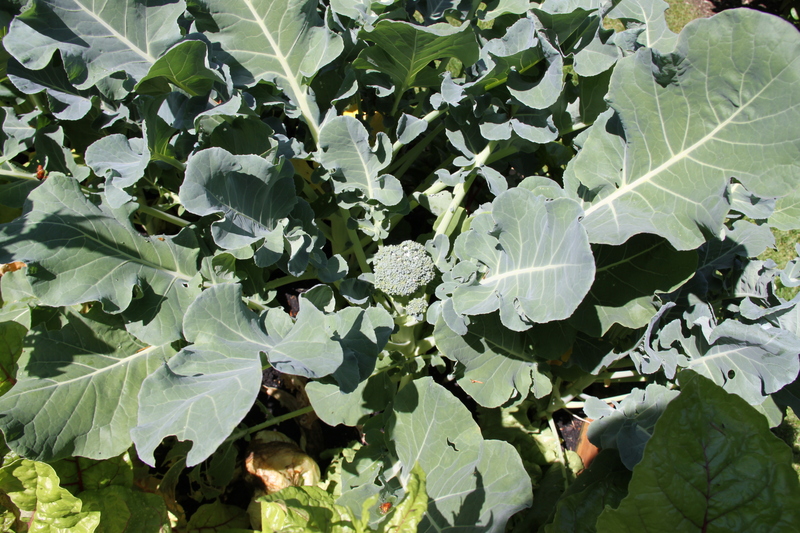 Unfortunately this broccoli will have to be discarded once harvested, but I was able to find some that were still edible and I’m holding out hope that the side shoots will produce as well. Fortunately my peas held out for me; in fact we’ve been enjoying an abundance of them for the last month or so. However, they required a considerable supplement to their support system. We added several nine foot poles to the bed that’s already a foot and a half off the ground-and they’re showing no sign of slowing down. Not sure what I’m going to do when they outgrow my husband’s considerable grasp! What’s wonderful about swiss chard is that it excels at resisting the urge to bolt in the summer heat-in fact not a single one of mine has gone to flower, which is more than I can say for my lettuce, spinach, kale and even broccoli! Though not as flashy as its red cousin, white stemmed chard does this even better than the colourful varieties and all of them shine at surviving light frost. 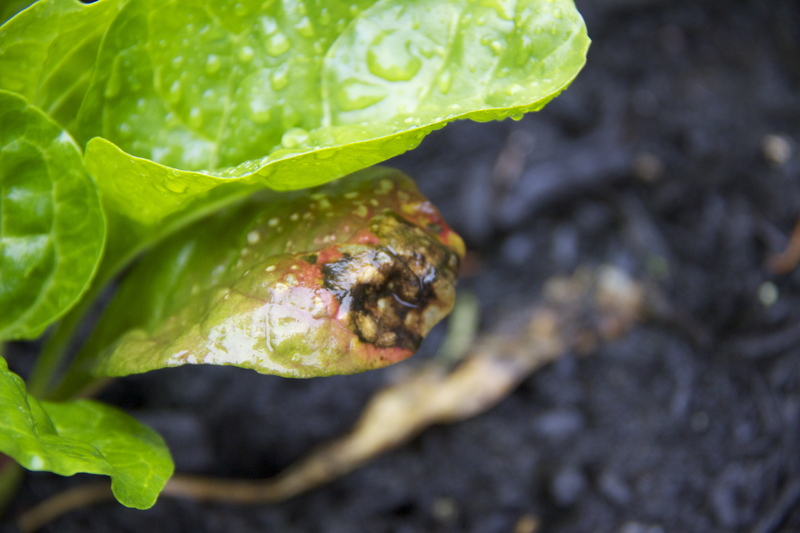 And despite our cool and rainy early summer, we managed to escape any Cercospora leaf spot (a fungal disease that causes light brown patches surrounded by purple halos that can form on leaves of chard, beets and sometimes spinach). Keeping plants properly spaced to promote good air circulation and promptly removing any diseased leaves apparently is key. To harvest, I cut individual outer leaves with a sharp knife and compost any old leaves that have lost their glossy sheen. Three to five leaves can be picked from mature plants at a time, and leaving the growing crown intact and picking frequently seems to help produce new leaves. Now I’ve been sneaking new leaves into salads, but older, bigger leaves do best when sautéed or added to soups and stews as any bitterness quickly fades. Or you could kick it old school and eat it straight out of the garden like my kids-they grab leaves as long as their arms and eat it like it’s cotton candy, complete with red streaks running down their faces! I had noticed recently that my potatoes were looking really rough and just assumed that I had been neglecting my watering responsibilities and silently gave myself a good scolding. 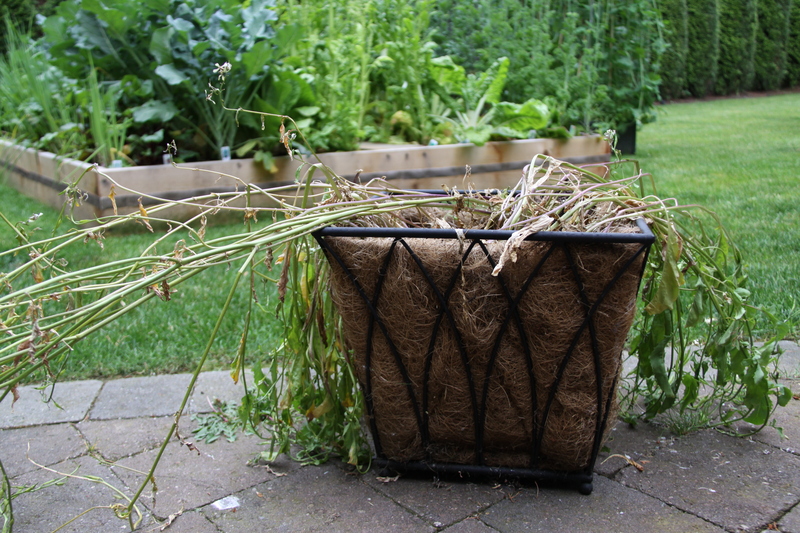 Turns out that the wilting I saw was just the potatoes being ready for harvest a few weeks sooner than I was expecting. So it’s unfortunate my guilty conscience drove me to water them right when I should have desisted, but I’ll let them dry out now and hopefully be able to enjoy a good harvest later this week. And hopefully they’ll keep until the weather calls for some comfort food! We were lucky enough to enjoy some of personal chef James A. Groot’s* superb fare last month at the Sustainable Food Expo. My oldest, after going back for fourths (sorry James!) of some amazing beets and beet greens, looked at me with a glazed over, zen-like expression and said “eating like this makes me feel peaceful…”. I couldn’t agree more! 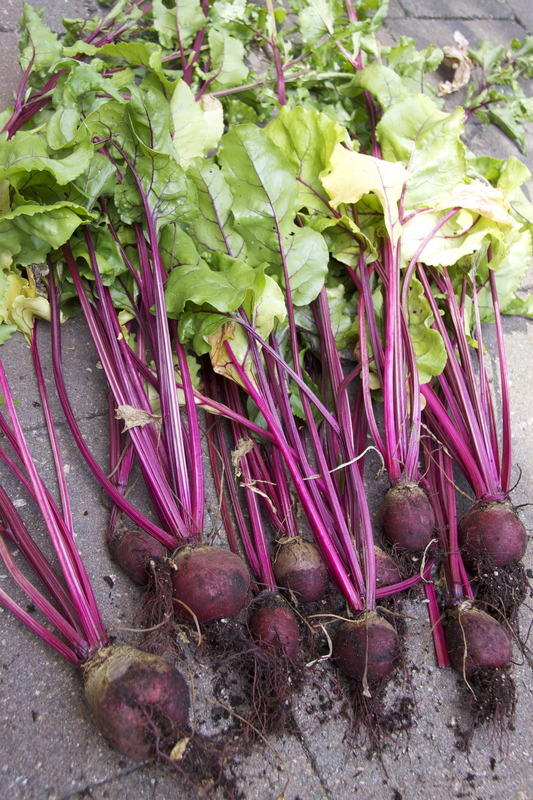 Beets thrive best in the cooler conditions of spring and fall and are at their optimum when harvested once they reach about an inch and a half in diameter; anything exceeding 3 inches will likely be tough and fibrous. I still have some in the ground and hope to plant even more in a few weeks. In fact, it’s recommended to plant the ones you hope to use over the winter about ten weeks before the first predicted frost-so you can see I’m being optimistic! And although they can easily be stored in the cellar (greens removed with no more than an inch of stem remaining) or even in the short-term, in the fridge in a plastic bag, here on the west coast we have the luxury of simply leaving them in the garden. 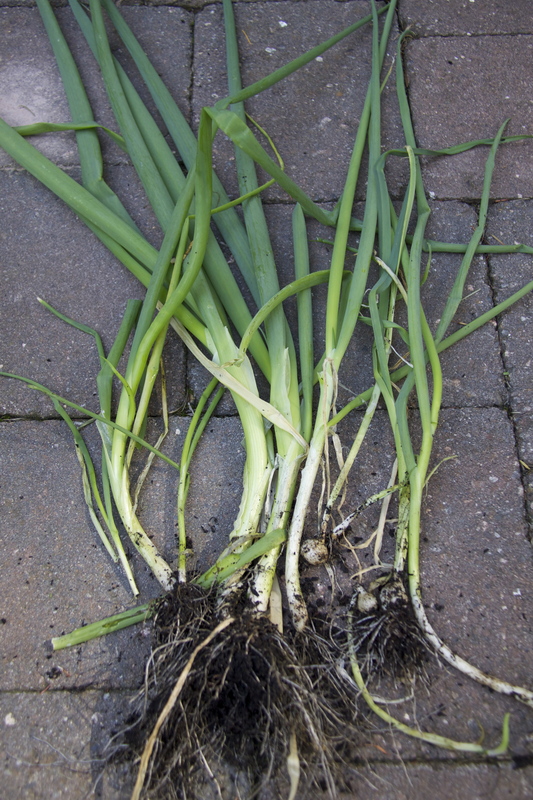 Cutting the tops off (and enjoying them, of course) is said to help retain the moisture in the root, but if you choose to leave the tops on, they’ll go dormant until about mid-February and then start to grow again-in which case they can be eaten up until April. And then we start all over again! *An experienced and gifted personal chef, James can be reached at jamesgroot@telus.net. 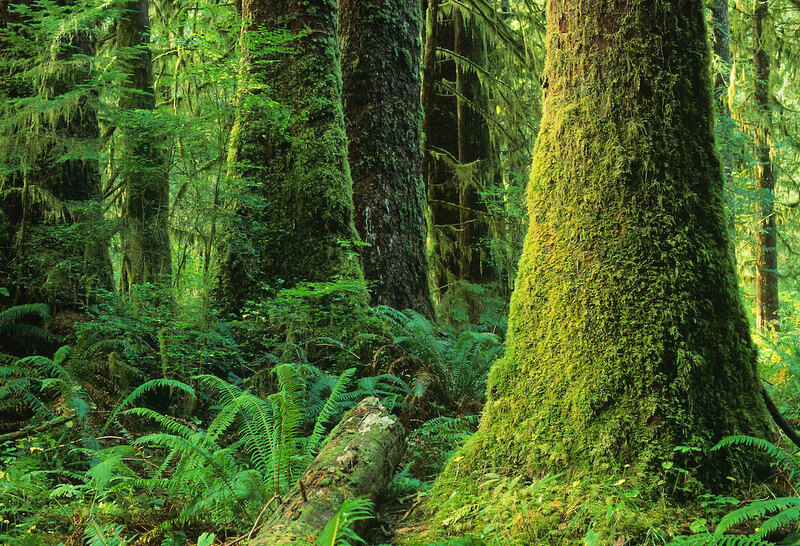 I knew that gardening in the middle of the temperate rain forest would have its challenges; especially given that we back on to a forest. However, I underestimated the extent to which the local bears, raccoons, skunks, squirrels and crows would treat it like their local supermarket. And why wouldn’t they? It’s all laid out for them, just waiting to be discovered. I feel like a sucker-is it too crazy to imagine them chuckling behind my back? I’m sure the answer to that one is yes. This afternoon I arrived back home to find this plant and two others knocked over, soil everywhere and all traces of tomatoes gone. Bears are a huge problem here-they’re in and out of people’s backyards throughout the day and night. One in particular, the “Big Bear” as we call him, spends a fair bit of time in our front yard and will even come right up to the front door and look in through the windows. But I can’t lay all the blame on him -two days ago I looked out my bedroom window just in time to see a crow fly off with one of my roma tomatoes in its talons! My window was wide open so I kept my comments to myself. Now this bed has been planted, dug up and eaten, replanted, dug up, eaten and replanted again. It’s definitely the work of something with opposable thumbs-my money is on those thug raccoons. I’ve grown to begrudgingly admire their efficiency-they’re extremely meticulous. And while it’s starting to get old, I have learned that while skunks will dig indiscriminately and make an un-holy mess of everything, raccoons will be much more selective and methodically go about their business. Jerks. So gone are my A-type straight rows; I employed more of a “square foot gardening” meets “grab whatever hasn’t been gnawed on too badly and stick it back in the ground before it dries out” method. Here we have cucumbers, zucchini, spinach, turnip, celery, butternut squash, swiss chard, broccoli, beets and kale. So far this pumpkin has escaped everyone’s attention and I’m really hoping it makes it to Halloween. Any thoughts on the ethical/legal implications of an electric fence in the middle of the city? On a brighter note, the animals seem a lot less enthusiastic about the eggplant (much like the rest of my family). Really, couldn’t anyone have thought of a better name for this plant?! Pretty benign in comparison; given all the distress caused by those thug raccoons I just didn’t have the heart to kick this little guy off-especially when you consider how hard he had to work to climb all that way! Unfortunately and somewhat predictably, my onions, leeks and beets have been suffering some neglect; as you can see the onions have gone to seed and the beet tops are looking more like vines! My plan is a rich chocolate beet cake! I love fall planting; after spring it’s my second favourite time of the year! As you can see I’ve added some Rhubarb swiss chard, more kale, Canary Yellow swiss chard, radicchio, some Paris Island romaine and some Rouge D’Hiver romaine, which as the name suggests, is resistant to cold and makes an excellent fall and winter crop. 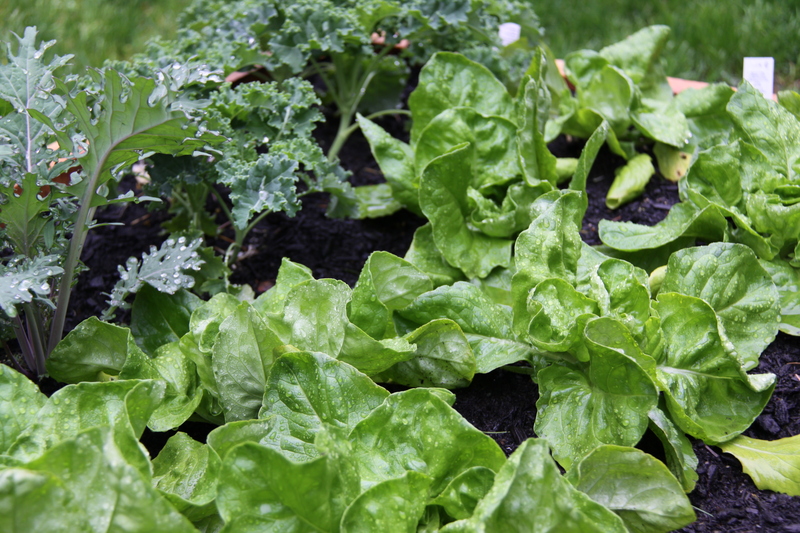 My spinach has reseeded on it’s own, but if yours hasn’t, you can still direct sow arugula and spinach seeds right into your soil and they will produce for you over the coming months. As a child I remember bringing home boxes upon boxes of produce from my Grandparents’ farm in the Okanagan and spending what seemed like the next week canning with my mother-though I may have been more of a hindrance than a help! Wash wide mouth mason jars in hot water and put in preheated oven to keep warm. Bring water and pickling salt to a boil so salt dissolves. Lightly scrub cucumbers and cut off tips at both ends. In each jar add l garlic clove and 1/2 tsp alum. Add one dill sprig to the bottom of the jar, add the cucumbers and the follow with another dill sprig. Fill jars slowly with water – leave 1″ from top. Run a knife along the inside of the jar to remove any bubbles. Seal tightly and let sit before moving to cool room. And you’re done-definitely the easiest of the three! Wash jars in hot water and put in oven to keep warm. Fill canner with water and bring to boil. Boil a second pot of water to place peaches in for a short time to loosen the skin and remove skin gently with a paring knife (after an approx. 5-10 min soak it peel easily). Move the newly skinned peaches into some cold water with some coarse salt added (this will stop them from browning). Cut peaches in half or in slices, remove the pit and transfer into another lightly salted cold water wash to sit until enough peaches are ready to fill the jars for the canner (approximately 5-7 jars per canner). In each jar add either 1/4 cup sugar or 1/4 cup honey. Fill jars with peaches and then pour boiling water into each jar to 1″ from top. Swirl a knife through the jar to remove any bubbles. Seal tightly and place in canner of boiling water very slowly so jars don’t break. Boil peaches for 15 to 20 mins. Remove and let cool. One case/box of peaches should fill about 12 wide mouth mason jars. Pears unfortunately need to be peeled and cored (which can, of course, take a fair bit of time) before they are put in the salted cold water wash. Once that is taken care of, the canning process is essentially the same as for peaches. 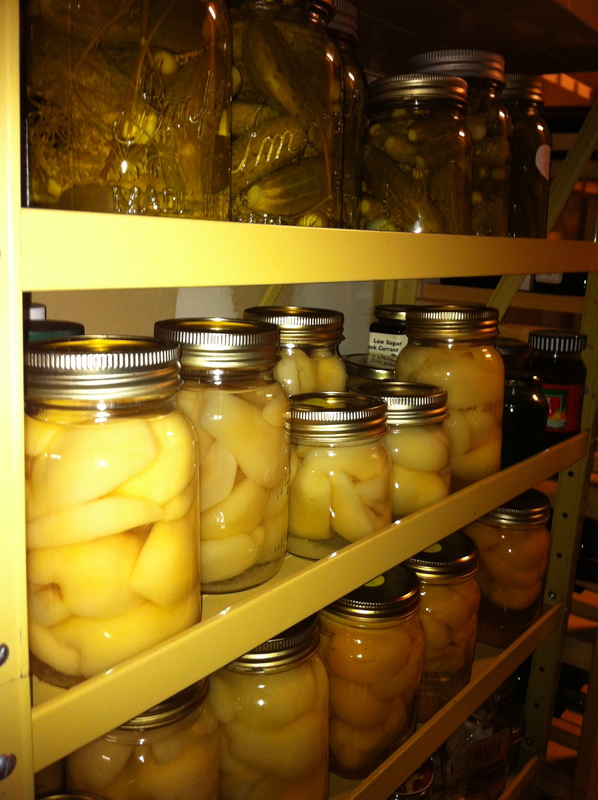 Fill the jars with sliced pears and then pour boiling water into each jar to 1″ from top. Swirl a knife through the jar to remove any bubbles and seal tightly. Place in canner of boiling water very slowly so jars don’t break. Boil the pears for 15 to 20 mins. Remove and let cool. A big thank you goes out to my Mum and Tante Jocelyne! Good morning. Discovered your Blog this moment. What an impressive collection of “spoils”, as you call them. Your family is spoiled indeed! May I as how much time all of this represents? I realize that it is a work of love and, as when you were a child, time is irrelevant. It is the joy of the process and result that matter, but I like numbers. They give things a new perspective. Enjoyed my visit very much. Will surely return. Thank you. 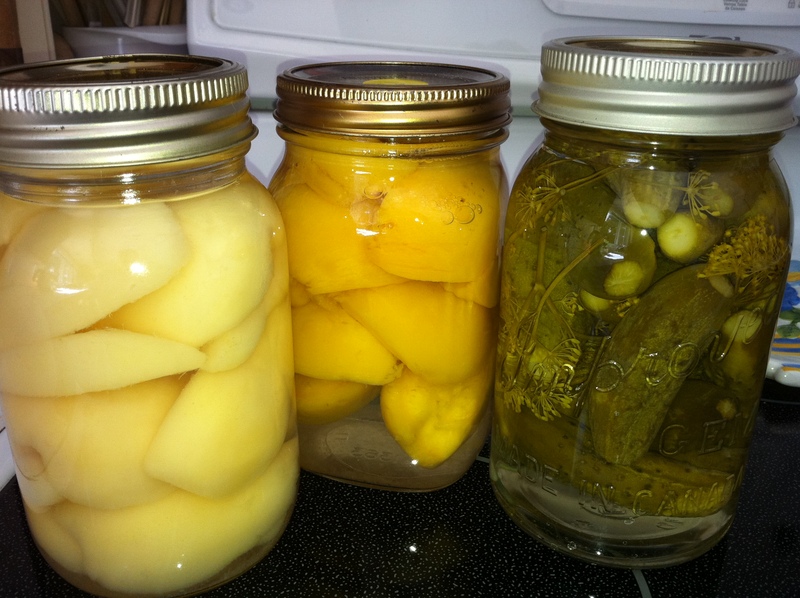 Loving the information on this website Canning Peaches, Pears & Pickles | Adventures in Organic Urban Farming with Suzanne Denison you have done great job on the content . I called in the pros but no one had seen anything like it. 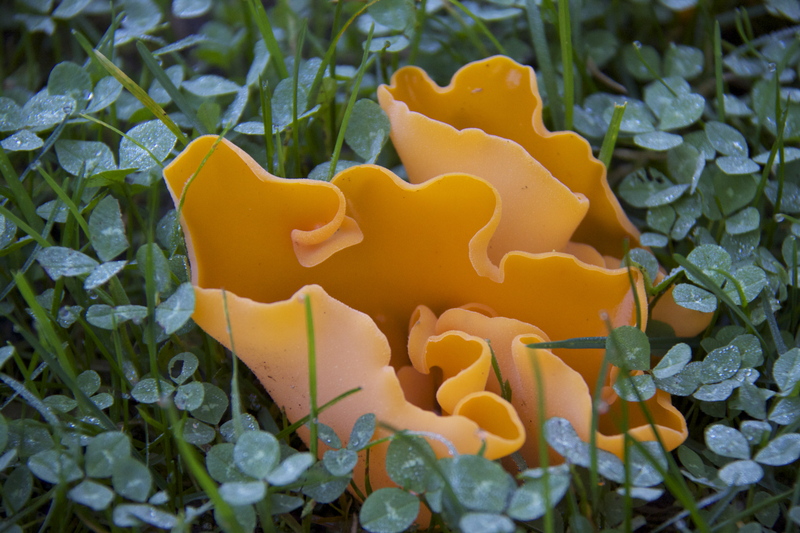 My best guess is that this could be Aleuria Aurantia, a brightly coloured fungi that grows mostly in the Douglas fir forests of Oregon, which closely mirror the temperate rain forests we have here on the South Coast of British Columbia. Any other ideas? Very pretty – must be a product of that lovely coastal moisture! I’m no fungi expert but it certainly does look like a.aurantia, and according to the Electronic Atlas of the Plants of British Columbia (http://linnet.geog.ubc.ca/Atlas/AtlasFungi.aspx?sciname=Aleuria%20aurantia) it’s been spotted a few times in your area. It’s also apprantly edible, if you’re game enough. Thanks so much Brad-happy to have you! And that’s a great resource you included-thank you! So, it’s edible you say…I may need more than a little wine in me to work up the courage to try that! I dug up the last of the carrots for an American Thanksgiving dinner we hosted for some ex-pat friends of ours over the weekend. I had been spacing out and replanting the carrots as we used them over the last few months; the ones that remained were even sweeter for having gone through a frost. 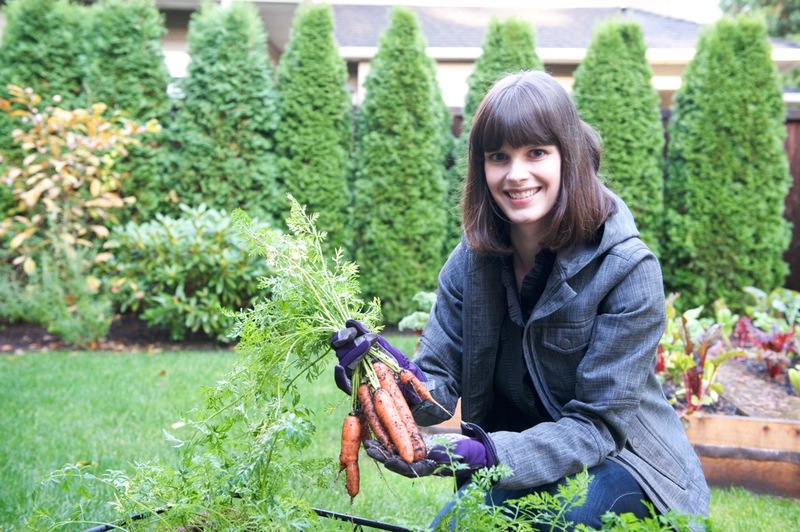 If you happen to have carrots, beets or other cold-tolerant root crops left, simply cover the exposed shoulders with leaves or loose straw and they will continue to grow and sweeten until you’re ready to use them. In fact, the cooler temperatures is what causes the plants to accumulate higher levels of sugar, which not only help them taste better but also protects them from freezing. But with the cooler weather these last few weeks and with December upon us, this really is the last chance to harvest any of the summer plantings that still remain. Any surviving tomato plants that have managed to escape blight should be pulled from the ground and hung upside down in a cellar or cold room in a last ditch effort to ripen any tomatoes that may be left. My cucumbers, zucchini, squash and pumpkin are done, but if you’re lucky to still have some left, the cellar or basement is their best bet before they rot in the rain. 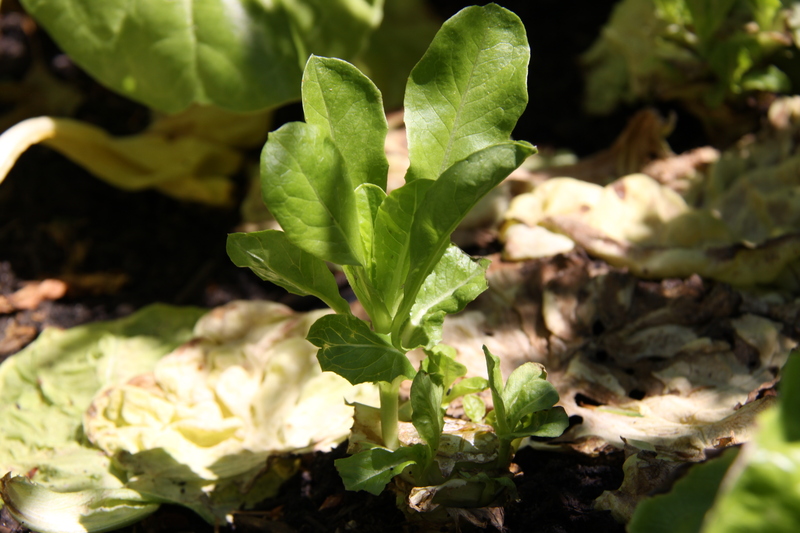 Here on the West Coast, the official word is that broad beans, spinach, radishes and arugula can still be sown directly into the soil and should be ready to eat in early spring-that is, if they don’t get washed away by a torrential down pour in the meantime. 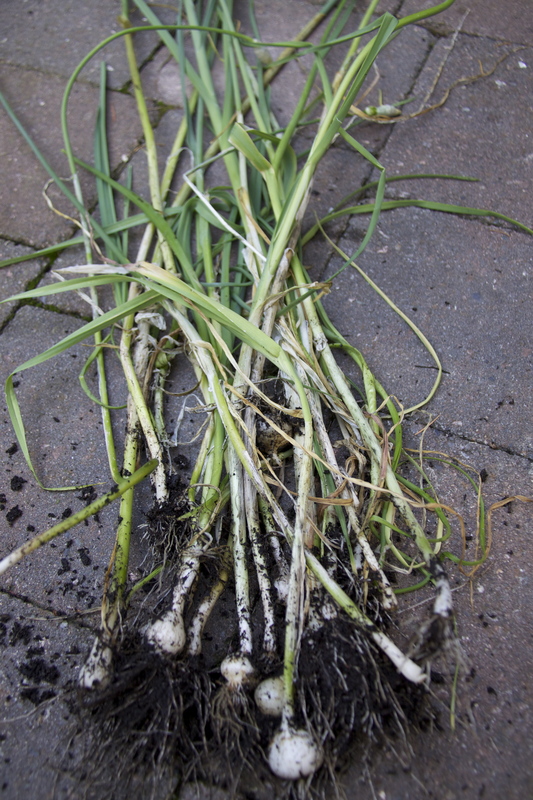 Garlic too can be planted now and will be ready for harvest in about 9 months. I worry about seed rot this time of year and plan to focus on what I already have in. 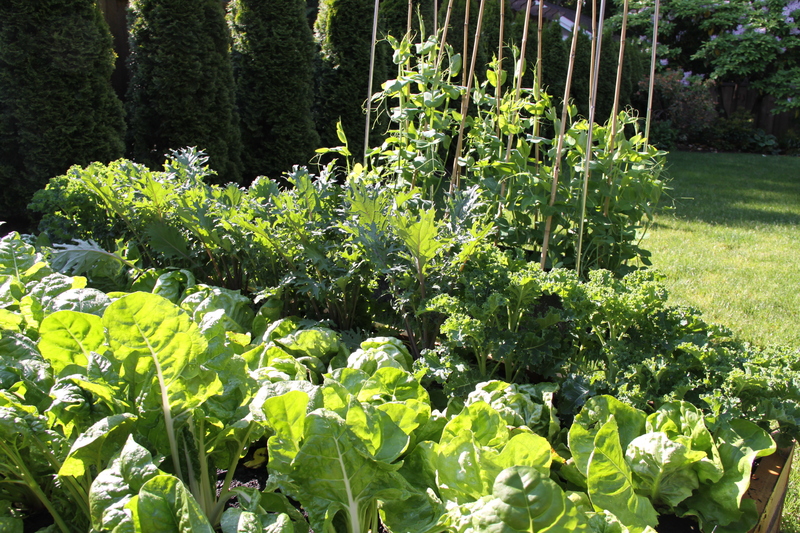 The garden is as full as ever with swiss chard, spinach, kale, broccoli, parsley and hardy lettuces. Row cover is all that is needed when the temperatures approach zero (although I have yet to actually use it, and despite my garden being full of Cedar & Douglas Fir needles, it’s actually not looking too worse for wear). 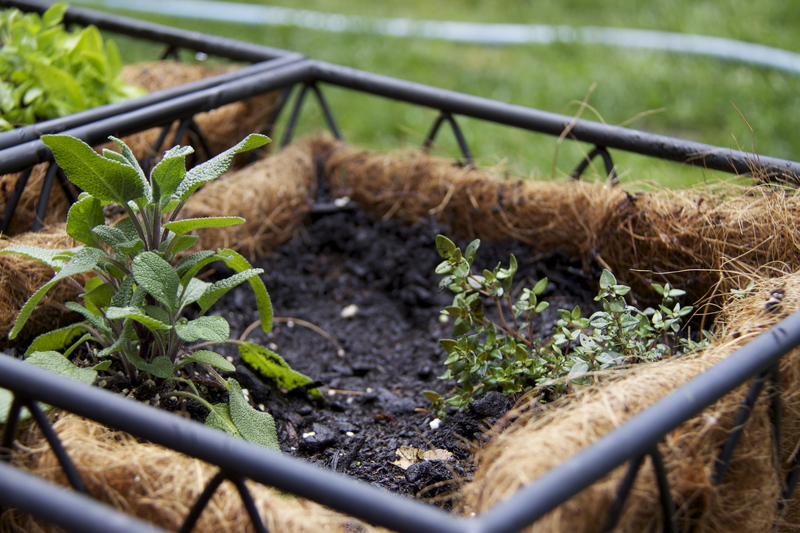 Cloches made of wire and plastic that hover just over the plants are a great DIY project for those with time on their hands-for me, with everything else going on this time of year, it’s all about survival of the fittest! The list of chores I already know won’t get done. January is supposed to be a time of renewal and an opportunity to be energized by new commitments to exercise, diet and a host of other well-intentioned ventures. But honestly, everyone I know is just plain exhausted and still recovering from all the chaos of Christmas. Even the most enthusiastic of gardeners can feel the need to enjoy the down season before Spring arrives with all its happy obligations. But for those keeners eager to get going, this list is a good place to start to put the rest of us to shame. 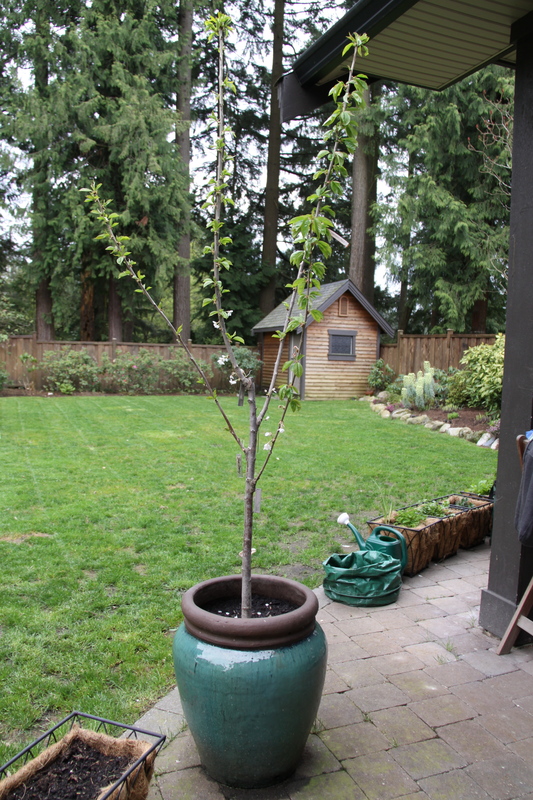 -take note of all the areas of standing water in your yard and garden and plan how to improve drainage. Sounds like a party, I know, but I for one really need to do this. 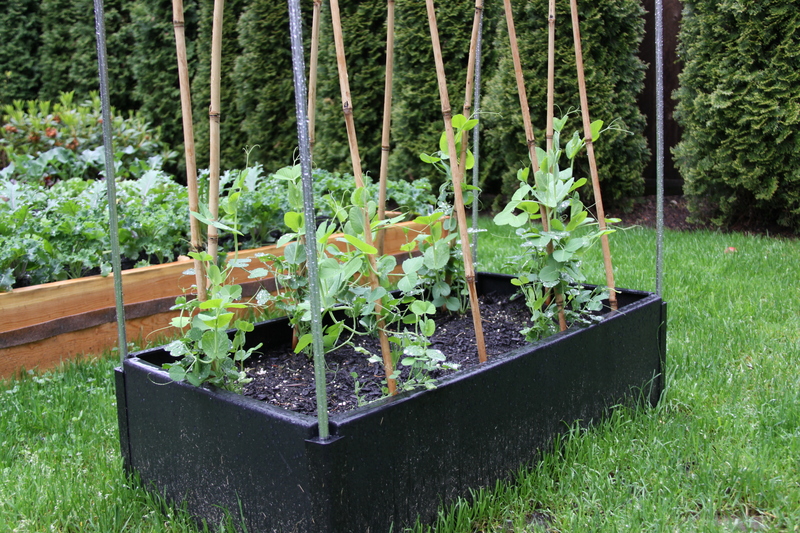 -in theory, direct sow seeds of peas, broad beans, watercress, dill, beets, radishes, carrots, parsley, bok choy, etc. I’m still waiting for that “coldest winter in 20 years” to show up and will be delaying that for at least a month or so. -prune vines, bushes and fruit trees; always a good stress relief but to be avoided if feeling particularly frustrated, lest you over do it. As you may remember, my fruit trees still look like some tall sticks in a pot, so I’m not even going to bother this year. -start some seeds indoors, such as tomatoes, eggplant and peppers. -and as always, we could all be spreading out compost, spreading mulch around plants and using row cover when the temperature dips (although in the interest of full disclosure I should say that I have been exceedingly lazy in this regard). -and of course you can continue to harvest any root vegetables or brussel sprouts sweetened by frost and whatever cold hardy lettuce, swiss chard and kale still in the garden. 11 Responses to Blogs are Backwards! I’m really enjoying the design and layout of your site. It’s a very easy on the eyes which makes it much more enjoyable for me to come here and visit more often. Did you hire out a designer to create your theme? Outstanding work! Oh, what stunning poohts! Nothing beats garden fresh food and how wonderful that you are introducing your children to these delights at a young age. That red leaf lettuce is spectacular! I truly appreciate this post. I have been looking all over for this! Thank goodness I found it on Bing. You’ve made my day! Thanks again! I like this weblog it’s a master piece! Glad I discovered this on google. Some genuinely grand work on behalf of the owner of this website, absolutely outstanding content material. I think it is so fantastic that your llttie one eats kale from the garden! How cool is that?! I wish I would have even known what kale was 8 years ago when we had our first child. I am browsing this site and reading very informative posts here. © Suzanne Denison, Adventures in Organic Urban Farming and www.organic-urban-farming.com. Unauthorized use and/or duplication of this material and/or the photographs without express and written permission from this blog’s author and/or owner is strictly prohibited. Excerpts and links may be used, with permission, provided that full and clear credit is given to Suzanne Denison, Adventures in Organic Farming and www.organic-urban-farming.com with appropriate and specific direction to the original content.